Mint (Dry OG, HR). Generally well centred. Fresh base colour with commonly found rough perfs. Lovely crisp surcharge strike. Lovely looking stamp. Mint (OG, HR). Centred right. Base stamp with fresh colour and decent perfs. Some minor toning on top perfs noted for accuracy. Lovely centrally struck surcharge. Nice stamp. Used. Indistinct Cancel. 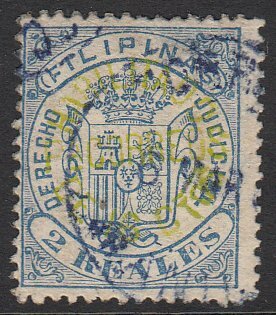 Base stamp centred left slightly, with odd blunt perf noted. Good colour. Very nice surcharge strike and light cancel not detracting overall appearance. Used. Telegraph Hole Punch. 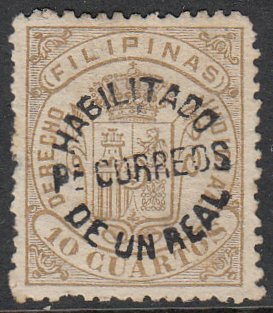 Exceptionally well centred stamp with crisp surcharge. Scarce usage. Beautiful looking stamp. Used. Parrilla Cancel. 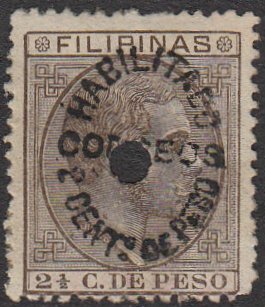 Base stamp centred slightly right. Commonly found rough or blunt perfs for this issue. 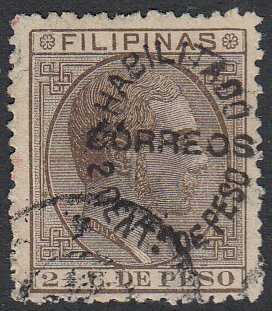 Nice overall looking stamp. Used. Telegraph Hole Punch. 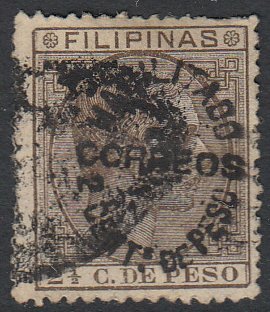 Base stamp centred left. Good colour. Commonly found rough or blunt perfs. Lovely crisp surcharge strike. Nice looking stamp. Used. Partial CDS. 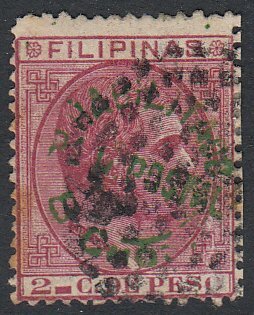 Base stamp generally well centred with good colour and decent perfs for this issue. 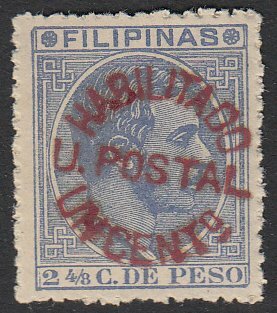 Nice overall looking stamp. Used. Telegraph Hole Punched. 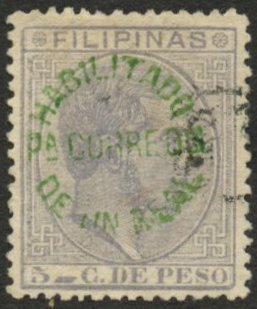 Base stamp centred slightly low. Good colour with odd blunt perf noted on top. Very nicely struck, clear surcharge. Used. Manila – Star CDS. 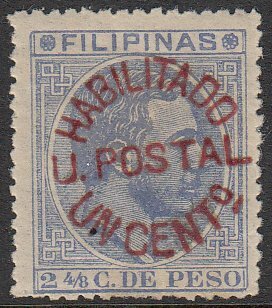 Well centred base stamp with good colour and decent perfs. Nice clean surcharge strike. 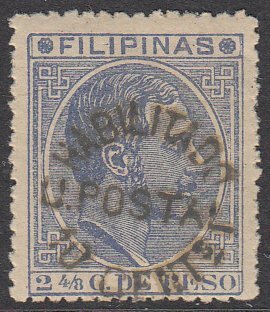 Difficult stamp to find fine postally used. Used. Indistinct Cancel. Generally well centred with good colour. Blunt perfs on left side. Decent surcharge strike. Decent looking stamp. Used. Parrilla Cancel. 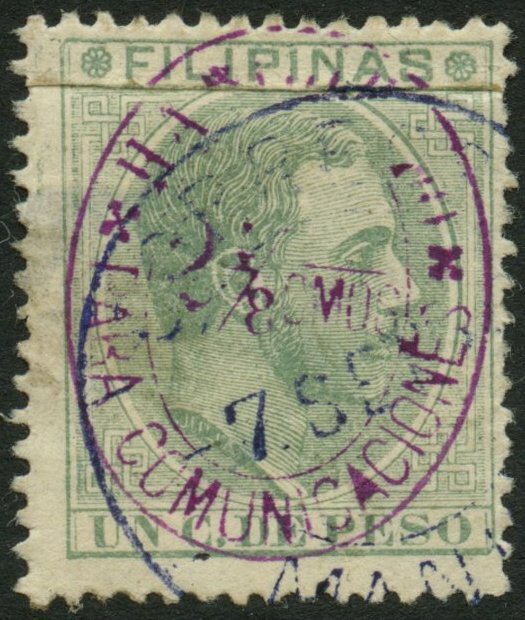 Base stamp centred bottom right. Good colour with average perfs, some blunt perfs noted. Clear surcharge strike. Used. Parrilla Cancel. 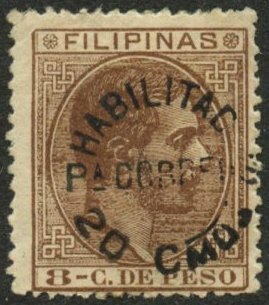 Base stamp generally well centred. Good colour and average perfs, with odd blunt perfs noted. Decent surcharge strike. Mint (Dry OG, HR). Well centred for this issue. Couple of blunt perfs noted, but common for this issue. Slight ink run on surcharge. Nice overall appearance. Mint (OG, HR). Fresh colour, centred slightly low. Odd rough perfs, common for this issue. Nice overall appearance. Mint (OG, HR). 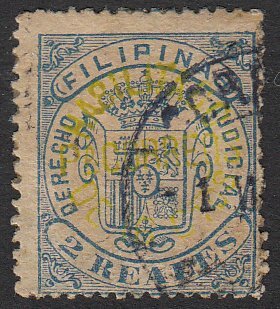 Generally well centred base stamp with commonly found rough perfs. Lovely surcharge strike. Very nice looking stamp. Mint (OG, HR). 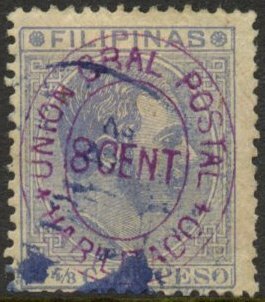 Base stamp centred low. Good colour with commonly found rough perfs. Well struck surcharge. Mint (NG). Centred low. Commonly found rough perfs for this issue. Good base colour and nice clear surcharge. Good looking stamp. Mint (OG, HR). Centred right. 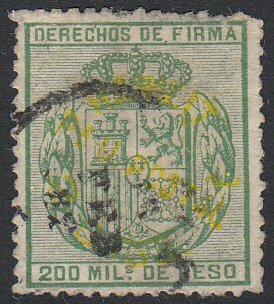 Very fresh colour with some rough or blunt perfs, common for this issue. Very nicely centrally struck surcharge. Nice stamp. Mint (OG, HR). Centred high. 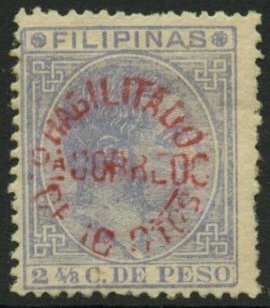 Good colour on base stamp with decent surcharge. Average perfs. Nice looking stamp. Mint (NG). Centred high. Good colour and lovely centrally struck surcharge. Average perfs for this issue. Mint (Dry OG, Heavy HR). 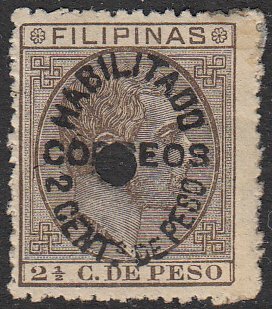 Base stamp centred slightly high. 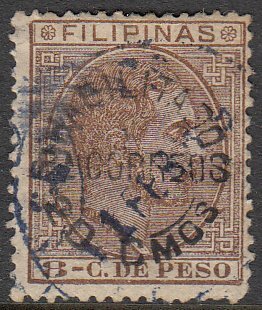 Good colour and sound stamp with nicely struck surcharge. Commonly found rough or blunt perfs for this issue. Used. 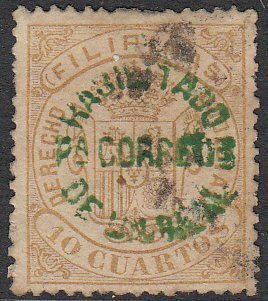 Partial Correos CDS. Base stamp centred left. Good colour with commonly found rough perfs. Minor perf toning noted for accuracy with top right corner rounded. Minor thin on reverse not showing through to front. Nice stamp. Used. 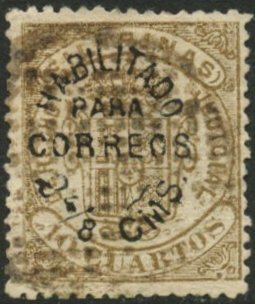 Partial Correos Cancel. 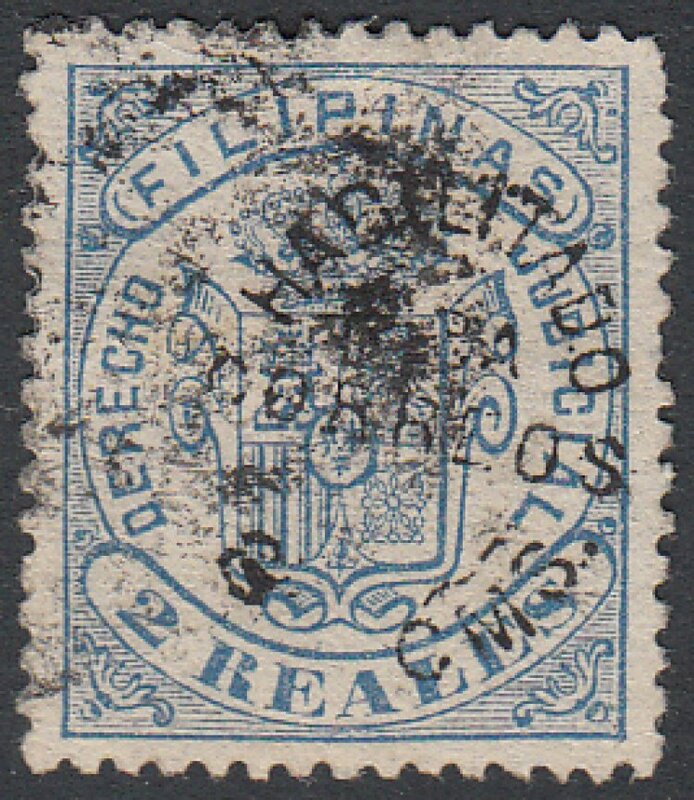 Base stamp centred top right. Good colour with commonly found rough or blunt perfs. Nice surcharge strike. Difficult to find used. Used. 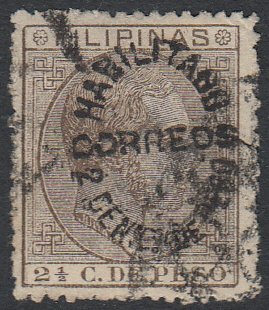 Partial Correos CDS. 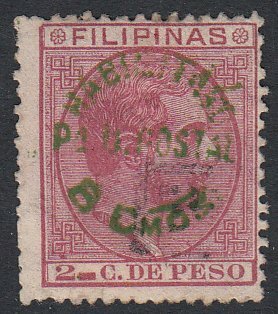 Base stamp centred top left. Good colour with rough perfs. Surcharge ink slightly run, otherwise a nice looking stamp. Mint (Dry OG, HR). 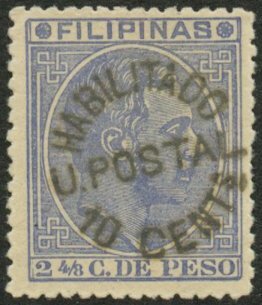 Base stamp centred high. Very fresh colour with average perfs, a few blunt perfs noted. Nicely struck surcharge. Good looking stamp. Used. 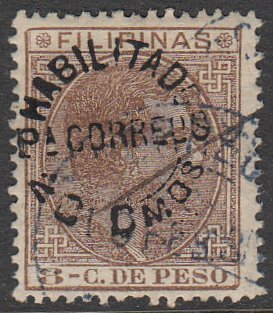 Correos – Manila CDS. 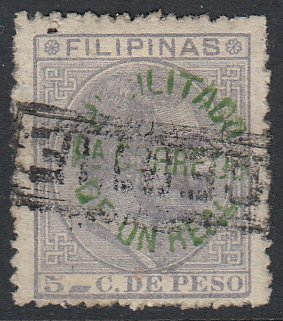 Base stamp centred right slightly. Very nice surcharge strike. Light cancel not detracting overall appearance. Seldom seen so fine. Used. 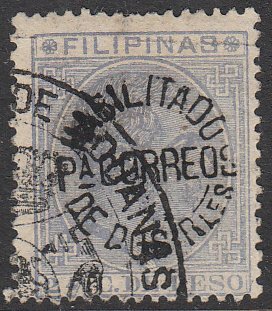 Correos – Manila CDS. Base stamp centred right with good colour. Odd blunt perf, rounded on top left and right corners. Decently struck surcharge, slightly cut on right. Used. Partial ‘Correos’ CDS. 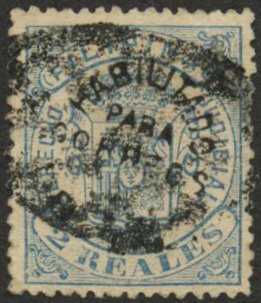 Well centred base stamp with odd blunt perfs, mainly on bottom. Light manuscript (pen) cancel applied. Good surcharge strike. Nice looking stamp. Used. Partial ‘Correos’ CDS. 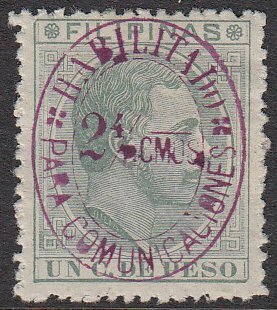 Base stamp centred top right with good colour. Rounded perf on bottom right corner. Average surcharge strike. Decent looking stamp. Used. 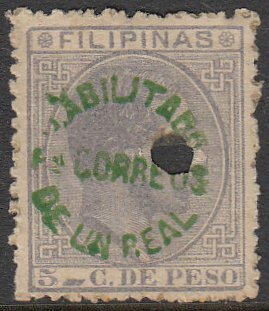 Correos – Manila CDS. Base stamp well centred with fresh colour. Slightly round perfs on bottom left otherwise decent looking stamp. Lovely clear surcharge strike. Mint (NG). Centred bottom right. Slightly foxed paper. Decent perfs. Nice surcharges strike. 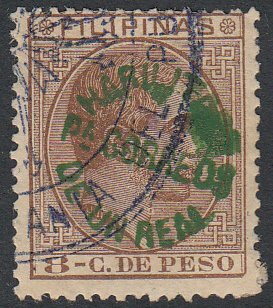 Very scarce stamp. Scott Cat $190. Mint (Dry OG, HR). 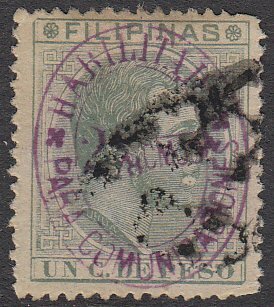 Base stamp centred bottom right. Good perfs but a few blunt perfs on right. Nicely centrally struck surcharge. Nice looking stamp. Used. 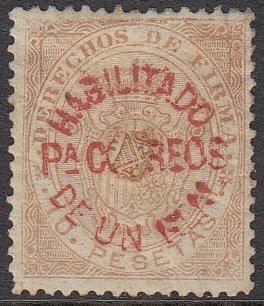 Partial Correos CDS. Base stamp well centred with fresh colour. Decent perfs. Lovely struck surcharge and light postal cancel. Lovely looking stamp. Used. 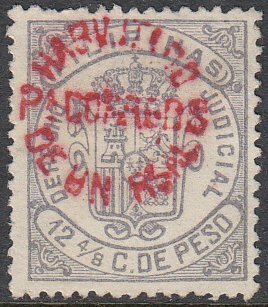 Partial Correos CDS. 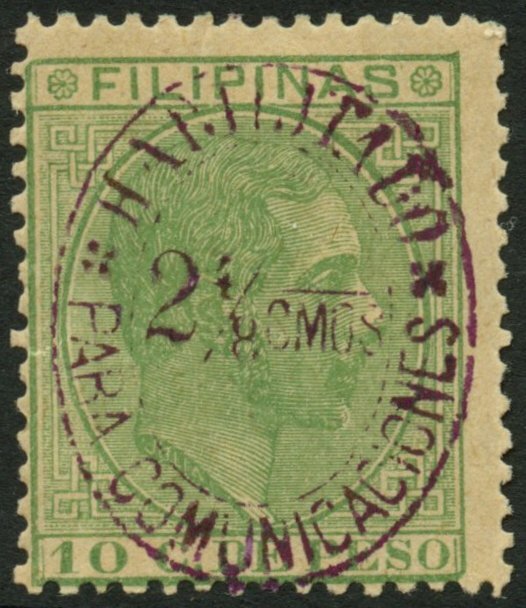 Base stamp centred top right. Good colour and generally good perfs. Clear surcharge with light cancel, not detracting overall appearance. Used. Telegraph Hole Punch. Generally well centred with good base colour. Very fresh surcharge. Rounded perfs on top right corner. Scarcer Surcharge Type. Used. Telegraph Hole Punch. 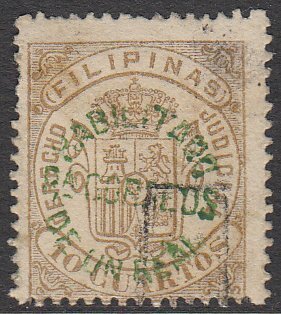 Base stamp centred top right. Good colour and a lovely crisp surcharge, centrally struck. Odd blunt perfs most noticeable on bottom left edge. Used. Manuscript (pen) cancel. Very vibrant colour on base stamp and crisp surcharge. Lovely stamp. Used. Telegraph Hole Punch. Partial Double Surcharge. Base stamps centred bottom right. Very clear surcharge on a sound stamp. Used. 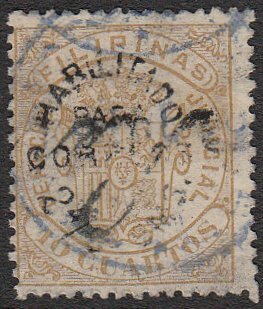 Very light partial Certif (Peterson Type 1) cancel. Base stamp centred left with light shade (possibly slightly faded). Nice clear surcharge. Scarce Registration cancel. Used. Telegraph Hole Punch. Generally well centred with good perfs and crisp surcharge. Scarcer surcharge type. Used. Possibly Parrilla Cancel. 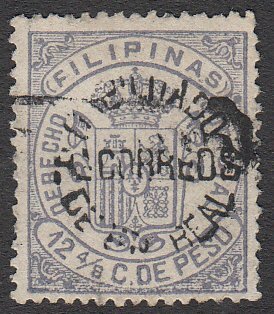 Base stamp centred bottom right. Good colour and decent perfs. 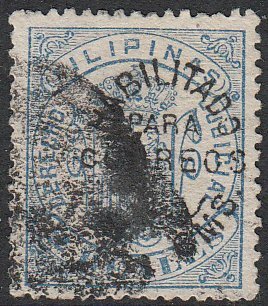 Slightly smudged cancellation. Decent surcharge strike. Used. Boxed Certif Registration Cancel. 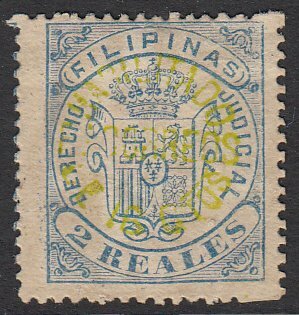 Generally well centred stamp with good colour. Light partial cancel. Scarce usage. Used. Official Cancel. 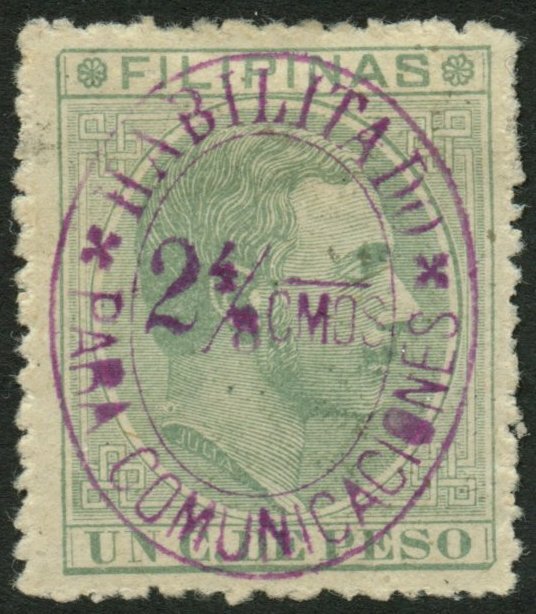 Base stamp centred low with good colour and average perfs (couple of blunt on top). Nicely struck surcharge. 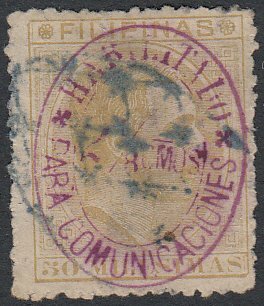 Scarce partial official cancel, lovely strike. Mint (OG, Light HR). 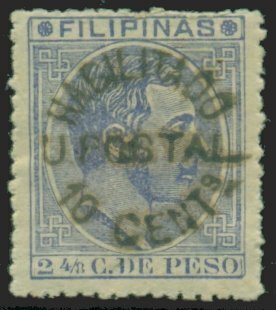 Generally well centred base stamp with decent perfs. Slightly foxy appearance, common for this issue. Good clear surcharge. 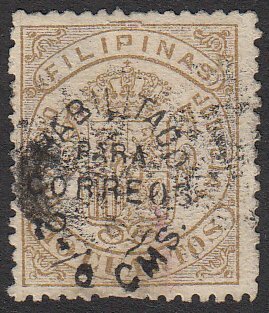 Scarce stamp. Scott Cat $57.50. Mint (NG, HR). Base stamp centred high with good colour. Lovely centrally struck surcharge. 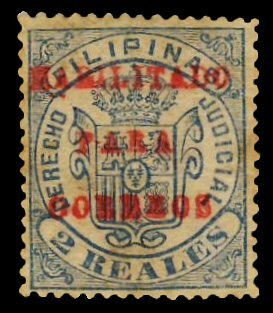 Generally fine stamp. Mint (NG, HR). Base stamp centred high with vibrant, fresh colour. Nicely struck surcharge. Fresh overall appearance. Lovely looking stamp. Mint (NG, HR). Centred top right. Base stamp with good colour. Commonly found rough or blunt perfs. Nicely struck surcharge. Good looking stamp. Mint (NG, HR). Base stamp centred bottom left. Fresh colour. 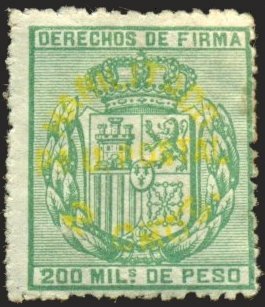 Rough or blunt perfs common for this issue. Decent surcharge. 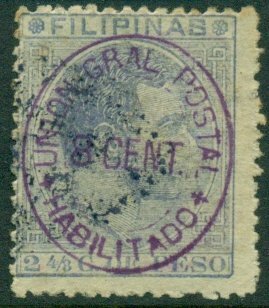 Average looking stamp. Used. Indistinct Cancel. Base stamp with very fresh colour and commonly found rough perfs. Decent surcharge strike for this issue. 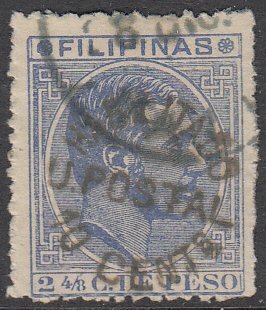 Nice overall looking stamp. Used. Indistinct Cancel. 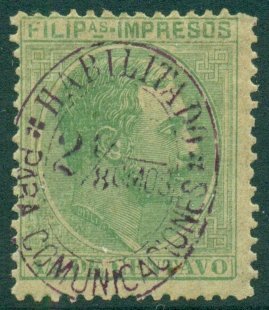 Base stamp generally well centred with vibrant colour. Odd blunt perf noted. Average surcharge strike. 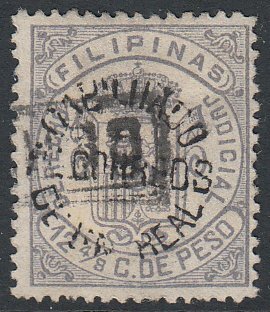 Lovely looking stamp with light cancel. Used. Parrilla Cancel. 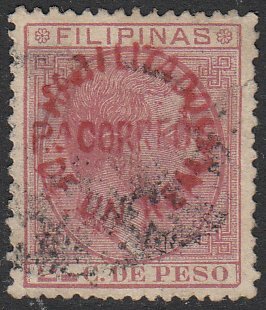 Base stamp centred low slightly. Very fresh colour and generally good perfs. Nicely struck surcharge. Used. Telegraph Hole Punch. 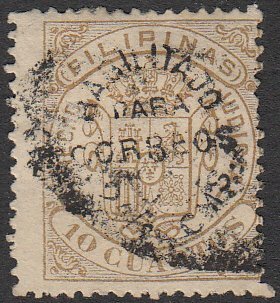 Base stamp centred top right. Nicely struck surcharge. Minor foxing noted, mainly on reverse. Used. Indistinct Cancel. Base stamp centred left with fresh colour. Average surcharge strike. 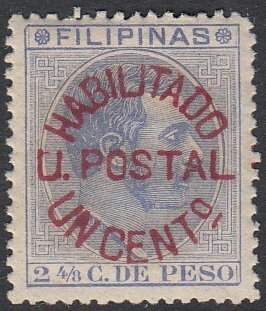 Nice overall looking stamp. Used. Manila – Star CDS. 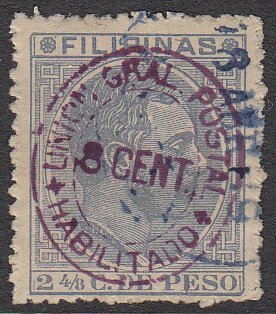 Base stamp centred low with good colour. Rough perfs with some blunt perfs noted. Average surcharge. Good overall condition. Used. 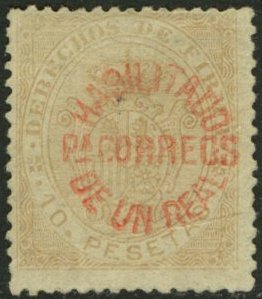 Octagonal Dotted Cancel. 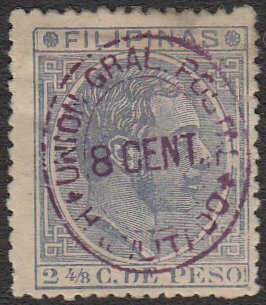 Base stamp centred low with good colour. 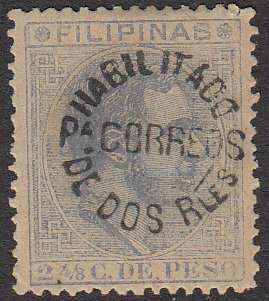 Narrow stamp with average perfs. 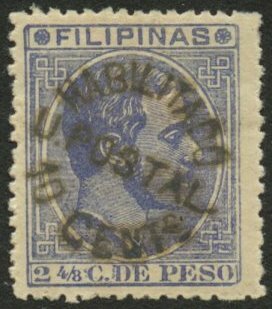 Minor toning on reverse. 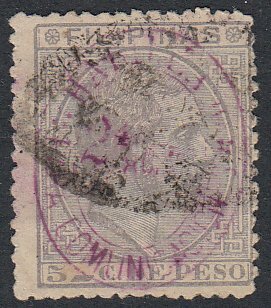 Very scarce postal usage and seldom offered. Used. Parrilla Cancel. Generally well centred. Base stamp with fresh colour and decent perfs. Lovely centrally struck surcharge. Thin on reverse not affecting front appearance. Nice stamp. Mint (Dry OG, HR). 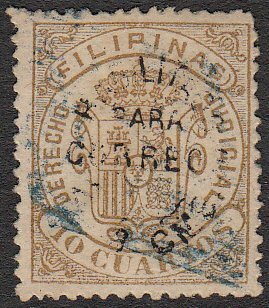 Base stamp well centred with good colour. Odd blunt perfs, common for this issue. Nice centrally struck surcharge. 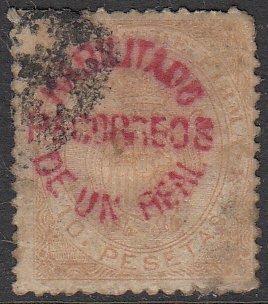 Small thin on reverse not affecting overall appearance. Mint (Dry OG, HR). Base stamp centred low with fresh colour and decent perfs. Couple of blunt perfs on bottom. 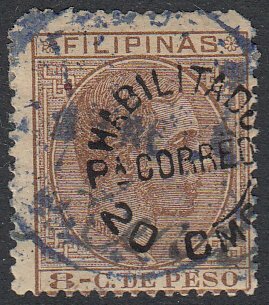 Very nicely struck surcharge and seldom seen so fine. Mint (OG, Heavy HR). 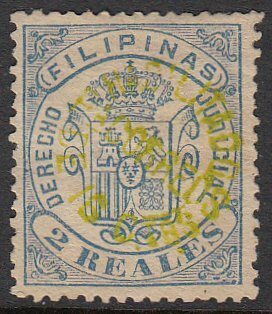 Base stamp centred bottom right with good colour. Commonly found rough or blunt perfs. Very nicely struck surcharge. Decent looking stamp. Used. Most Likely Telegraph Usage. 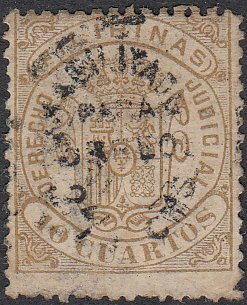 Base stamp well centred with lovely surcharge strike. 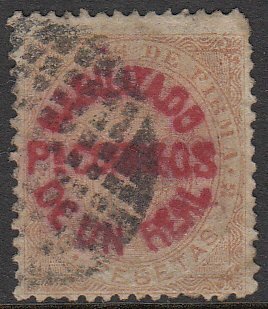 Light Correos cancel and partial Revisado handstamp. Very nice looking stamp. Used. Telegraph Hole Punched. Base stamp centred slightly low left. Good colour and generally decent perfs. 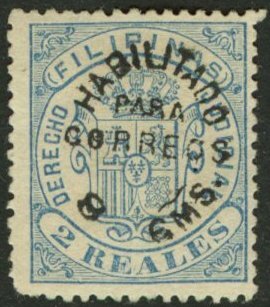 Partial Revisado handstamp. With partial CDS. Decent looking stamp. Used. Correos CDS. 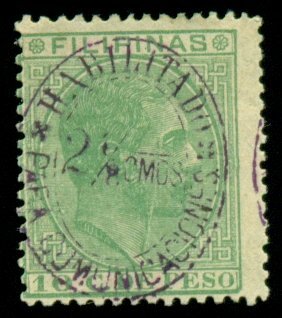 Base stamp centred low with good colour and commonly found rough perfs. Nicely struck surcharge. 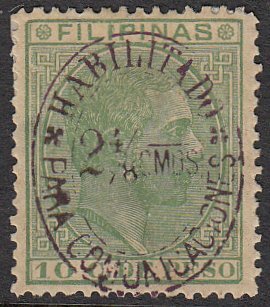 Attractive looking stamp and very fine used. Mint (Dry OG, HR). Base stamp centred slightly high, with good colour. Generally decent perfs but a few slightly blunt perfs on top. Nicely struck surcharge. 2015 Scott Cat Value $190. Used. 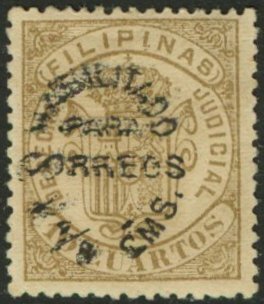 Boxed Certificado Cancel. Base stamp centred slightly high with good colour. Some rough perfs on right otherwise decent. Light cancel and clear surcharge strike. 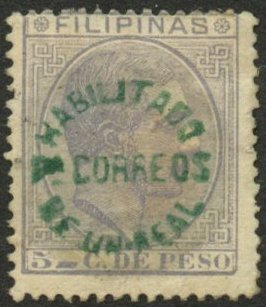 Scarce stamp. Scott Cat $150. Mint (Dry OG, HR). Base stamp centred top left with average colour and decent perfs. Some gum toning on reverse causing foxy appearance. Decent surcharge strike. Difficult in mint. Mint (NG, HR). Base stamp centred slightly high with fresh colour. Good perfs for this issue. Very clear and centrally stuck surcharge. 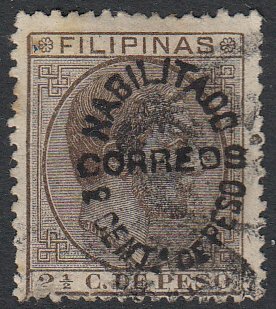 Nice overall looking stamp. Used. Partial ‘Manila – Star’ CDS. Rough perfs often seen on this issue. 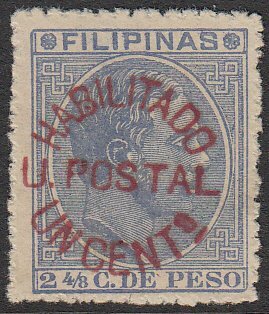 Scarce postal usage. Used. Partial Certif Registration cancel (Peterson Type 1). 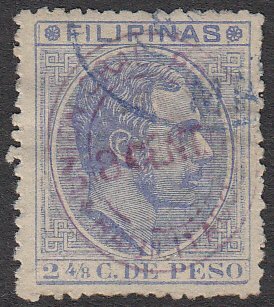 Nice looking stamp with good perfs. Light cancel not detracting overall appearance. Lovely stamp. Used. 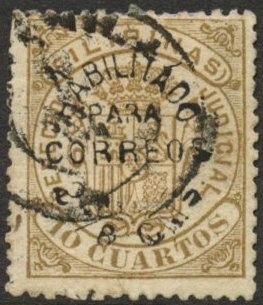 Light ‘Correos’ CDS cancel. 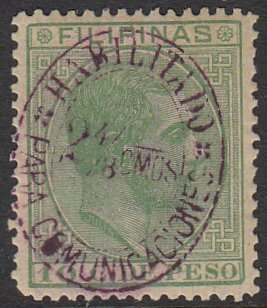 Well centred base stamp with very good perfs for this issue. Used. Circle of Dots Cancel. Base stamp centred top left. Good colour and sound perfs for this issue. Nice clear centrally struck surcharge. Very nice looking stamp. Used. Possible Parrilla Cancel. Generally well centred with good colour. Odd blunt or rough perfs, common for this issue. Decent surcharge strike. Used. Parrilla Cancel. Base stamp centred bottom left with generally good colour and nice perfs. Nicely struck surcharge. 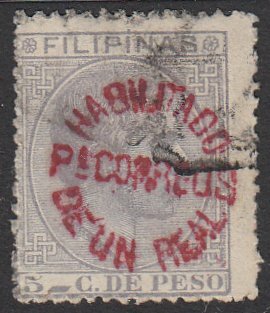 Average looking stamp. Used. 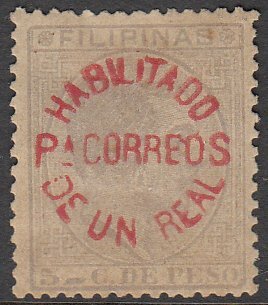 Partial Rectangular Boxed Certif Registration cancel. Base stamp centred bottom left. 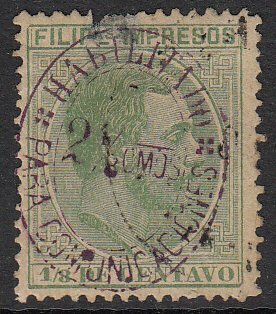 One blunt perf on top left otherwise a nice looking stamp. Nicely struck surcharge. Used. 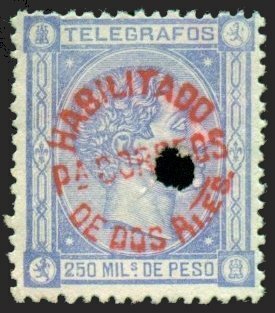 Telegraphic Hole Punch. Generally well centred. Good base colour with commonly found rough or blunt perfs. Nicely struck surcharge. Used. Boxed Certif Registration Cancel. 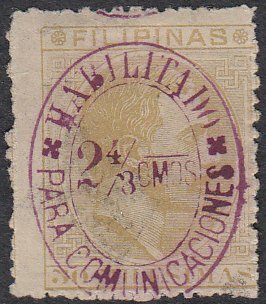 Base stamp centred slightly low with good colour. Some blunt perfs noted, common for this issue. 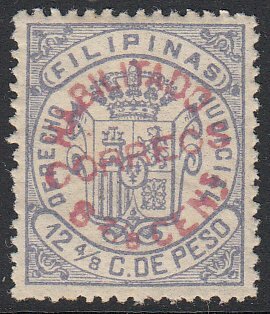 Lovely looking stamp with decent surcharge. Used. Telegraphic Hole Punch. 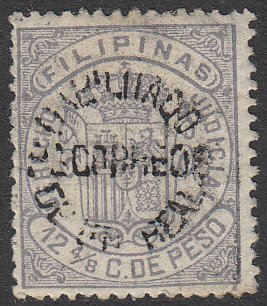 Well centred base stamp with clear surcharge. Lovely looking stamp. Used. Indistinct Cancel. Base stamp centred right. Horizontal crease on top. Good perfs and very crisp surcharge. Despite faults, nice looking stamp. Used. Parrilla Cancel. Base stamp centred bottom left. Good colour and average perfs, odd blunt perfs noted. Nicely struck surcharge. 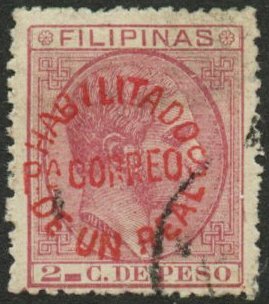 Average stamp. Used. Telegraphic Hole Punch. Base stamp centred bottom left. No other Telegraph cancels or marking. Nice overall appearance. Used. Telegraphic Hole Punch. Base stamp well centred. Odd rough perf, common for this issue. Very fresh surcharge. Nice looking stamp. Used. Telegraphic Hole Punch. 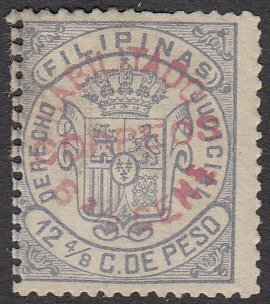 Base stamp centred right slightly. Average to good perfs, slightly rounded on top right corner. Fresh colour and lovely crisp surcharge. Used. Telegraphic Hole Punch. 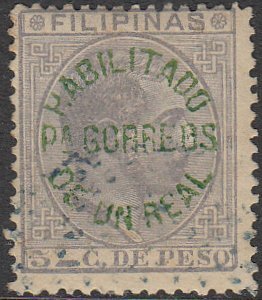 Base stamp centred bottom right. Odd blunt perf noted and minor toning on some perfs. Nice struck surcharge. Mint (NG, HR). Base stamp centred high with fresh colour and generally good perfs. Very nicely struck deep green surcharge. Lovely looking stamp. 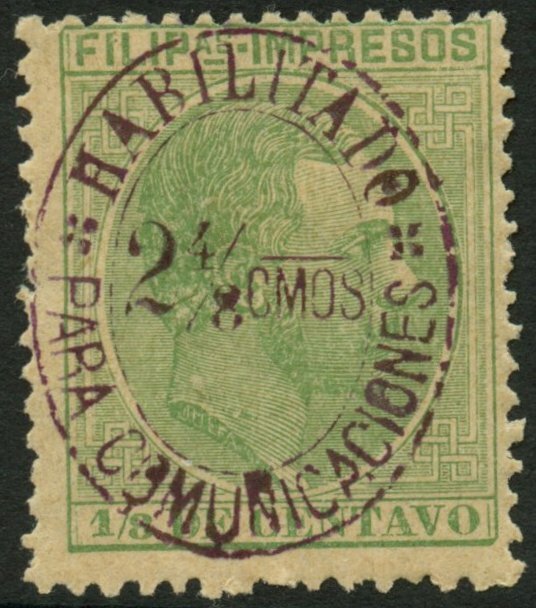 Mint (NG, HR). Base stamp centred right with good colour. Some rough or blunt perfs, mainly on right. 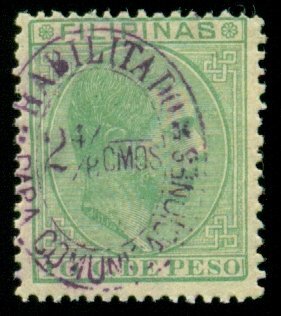 Lighter green surcharge strike. Decent looking stamp. Mint (Wrinkly OG, HR). 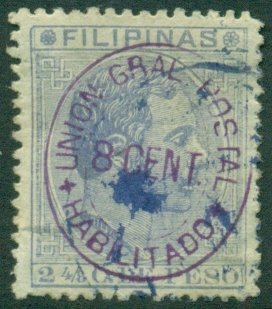 Base stamp generally well centred with good colour. Average perfs with odd blunt perf noted for accuracy. Nice centrally struck surcharge. Good looking stamp. Used. Parrilla Cancel. 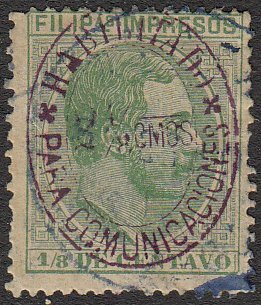 Base stamp centred bottom left with good colour and average perfs. Decently struck surcharge. Good looking stamp. Used. Official Cancel. 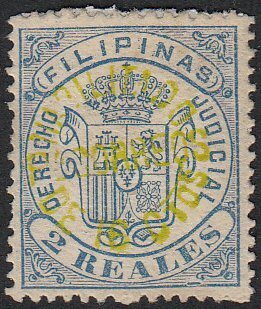 Base stamp centred high. Fresh colour and decent perfs for this issue. Very fresh overall appearance and scarcer usage. Used. Telegraph Hole Punched. 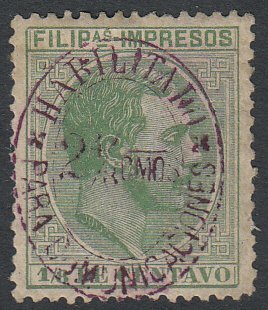 Base stamp centred left with fresh colour and average to good perfs for this issue. Lovely centrally struck surcharge. Very nice looking stamp. Mint (NG, HR). Base stamp centred top left with fresh colour. Average perfs for this issue. Nicely struck surcharge. 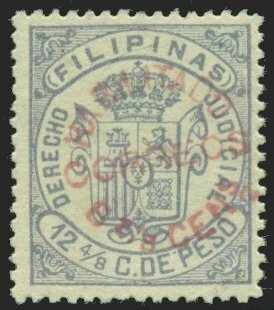 Nice overall looking stamp. Mint (NG, HR). Base stamp well centred with fresh colour. Some minor blunt perfs on left, common for this issue. Clear and crisp surcharge. Lovely looking stamp. Mint (Dry OG, HR). 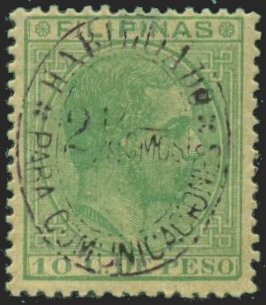 Base stamp centred low. Fresh colour with odd blunt perfs noted. Nice centrally struck surcharge. Lovely looking stamp. Mint (NG, HR). 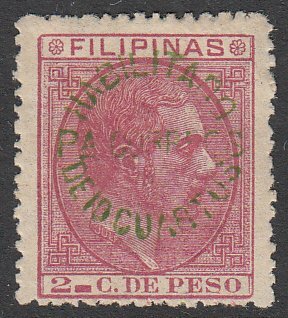 Base stamp generally well centred with good colour. Commonly found rough perfs. Nice centrally struck surcharge. Very nice looking stamp. Used. Indistinct Cancel. 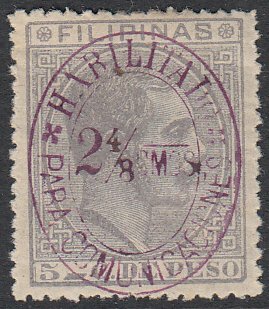 Base stamp centred high with fresh colour and decent perfs for this issue. Lovely clear surcharge strike. Interesting stamp. Used. Correos CDS. 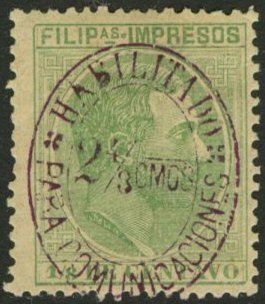 Base stamp generally well centred with good colour. Overall, good perfs for this issue. Very light postal strike. 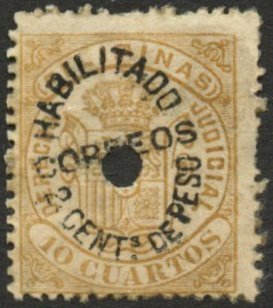 Scarce used, despite low Scott catalog value. Mint (OG, HR). 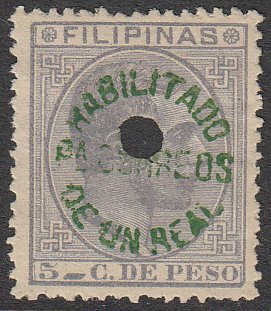 Base stamp shifted bottom left. Very fresh colour and overall appearance. Commonly fund rough perfs. Very clean and bright surcharge. Mint (NG, HR). 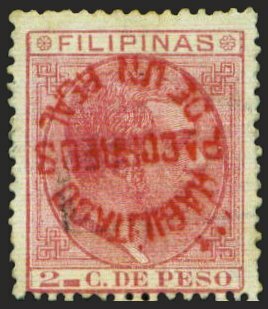 Base stamp generally well centred. Common rough or blunt perfs. Nice centrally struck surcharge. Thin on reverse not showing through to front. Nice looking stamp. Mint (NG, HR). Base stamp centred bottom left. Rough or blunt perfs. 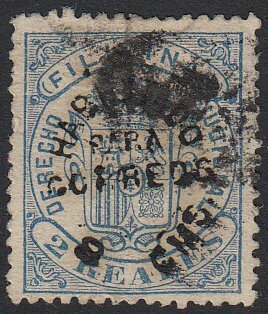 Diagonal crease otherwise a lovely looking stamp with nice surcharge. Mint (NG, NH). Base stamp centred slightly left with very fresh colour. Commonly found rough perfs. Crisp, centrally struck surcharge. A very fine looking stamp. Mint (Dry OG, Heavy HR). 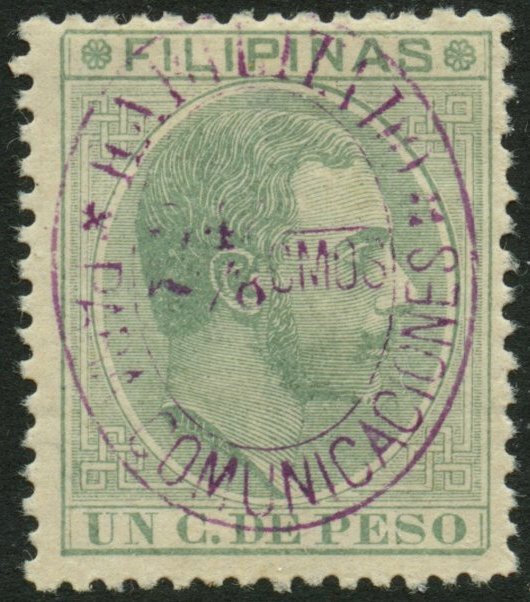 Base stamp centred low. Good colour. Commonly found rough or blunt perfs. Decent looking stamp. Mint (OG, NH). Base stamp well centred with vibrant, fresh colour. Commonly found rough perfs for this issue. Crisp surcharge strike. 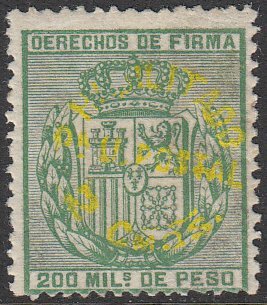 A choice stamp and very striking overall appearance. Mint (NG, HR). 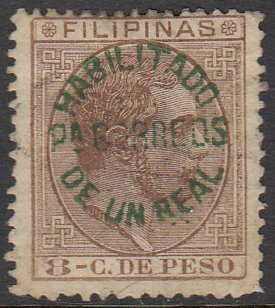 Base stamp centred bottom right. Good colour with generally good perfs for this issue. Nicely struck surcharge. Lovely looking stamp. Mint (Dry OG, HR). 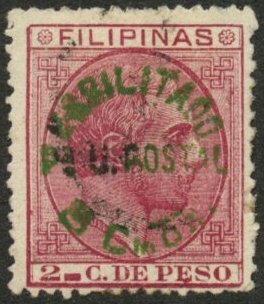 Base stamp generally well centred with good colour and decent perfs. Commonly found mottled surcharge. Very nice overall appearance. Mint (NG, HR). Base stamp centred bottom left. Good colour and decent perfs. Nicely struck, bright surcharge. Lovely looking stamp. Mint (Dry OG, HR). 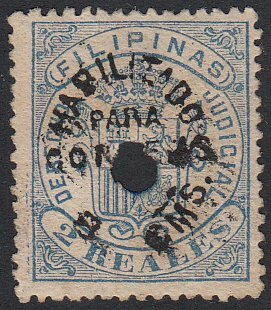 Base stamp centred bottom left with dull shade most likely caused from gum disturbance on reverse. Good perfs for this issue. Nicely struck surcharge. Average. Used. 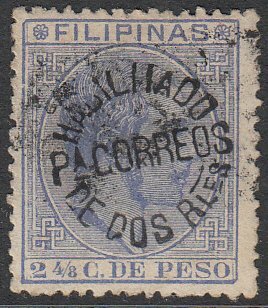 Partial Correos – Manila CDS. 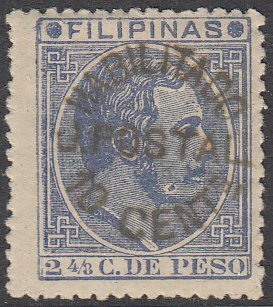 Base stamp centred low with good colour and decent perfs. Well struck surcharge. 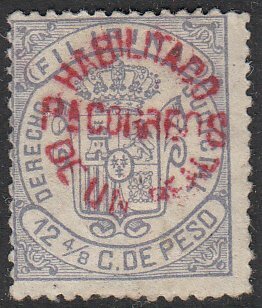 Additional Revisado handstamp. Scarce used. Used. Telegraph Hole Punched. Base stamp centred left with good colour and decent perfs. Good surcharge strike. Punch hole not removed and almost appears mint. Mint (NG, HR). 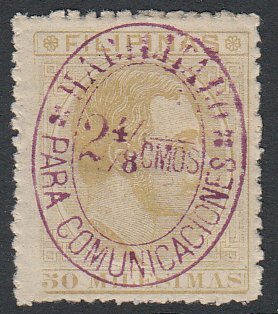 Base stamp centred top left with good colour and average perfs. Some paper adhesion on back which should wash off. Good surcharge strike. Nice looking stamp. Mint (OG, Heavy HR). 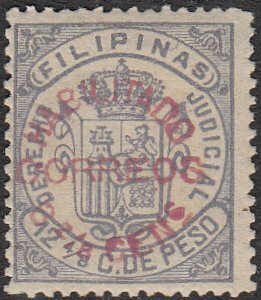 Base stamp centred bottom right. Good colour. Blunt perfs on right with hinge just showing through on edges. Lovely crisp surcharge. Nice stamp. Used. Fancy Certif Registration Cancel. 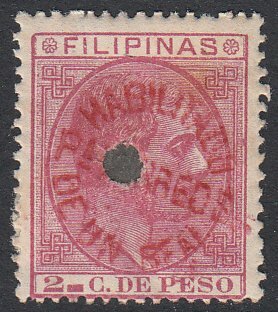 Base stamp generally well centred with good colour and decent perfs for this issue. Crisp surcharge with light cancel not detracting overall appearance. Used. Boxed Certif Registration Cancel. 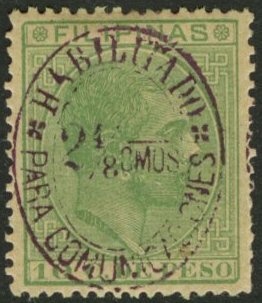 Base stamp centred left slightly, with good colour but rough or blunt perfs. Nice clear surcharge strike. Light cancel. Decent stamp. Used. Indistinct Circular Cancel. 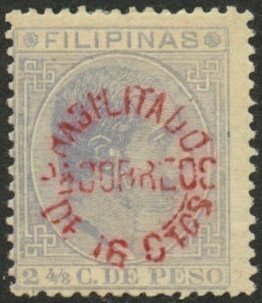 Base stamp generally well centred. Commonly found rough perfs with good colour. Nice clear surcharge strike. Light cancel. Nice looking stamp. Used. Telegraph Hole Punched. Base stamp centred right slightly with fresh colour and decent perfs. Crisp surcharge. 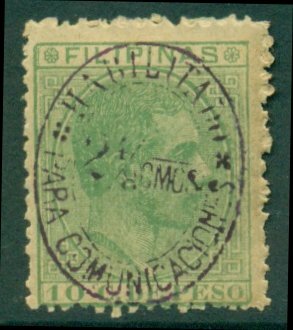 Very appealing stamp with telegraph usage. Mint (OG, HR). 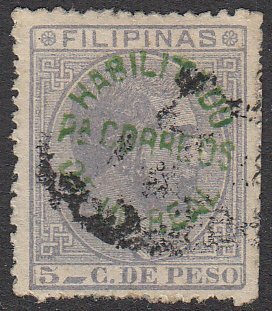 Base stamp well centred but slightly faded. Blunt perfs on top. Small smudge mark on top (not a cancel). Decent surcharge strike. Difficult to find mint. Used. Official Cancel. 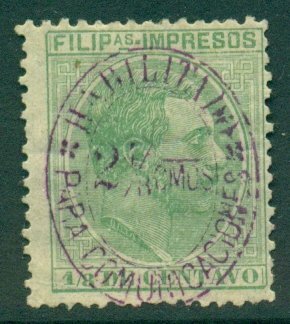 Base stamp generally well centred with good perfs. Surcharge shifted to bottom left and cropped on bottom. 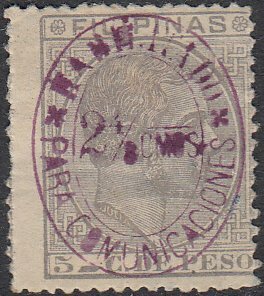 Some foxing on stamp from toning on reverse. 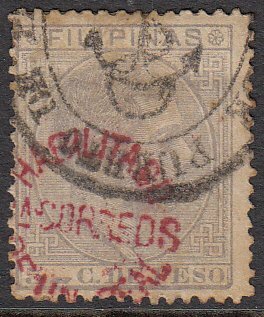 A very scarce official cancel usage. 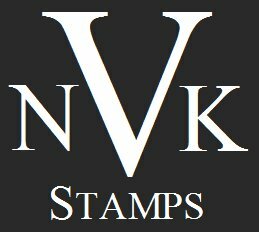 Lovely stamp for the postmark specialist. Used. 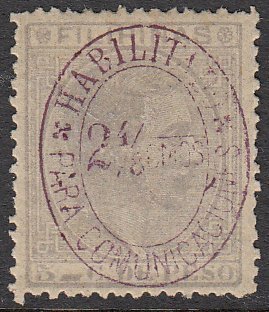 Partial Fancy Certif Registration Cancel. Base stamp centred left with good colour. Rough or blunt perfs, common for this issue. Nice crisp surcharge. 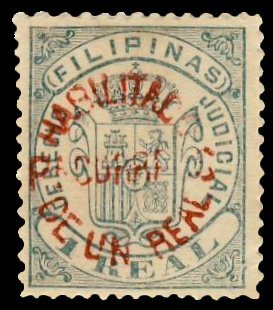 Average stamp. Used. Indistinct Cancel. 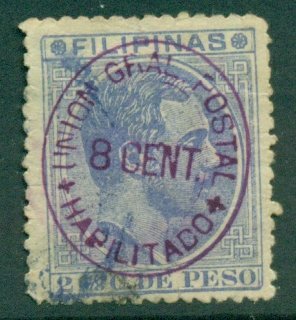 Base stamp generally well centred with good colour and decent perfs. Nicely struck surcharge. Nice overall appearance. Mint (OG, NH). Base stamp generally well centred with very fresh, vibrant colour. Decent perfs for this issue. Nicely struck surcharge. Seldom offered so fine. Mint (Dry OG, HR). 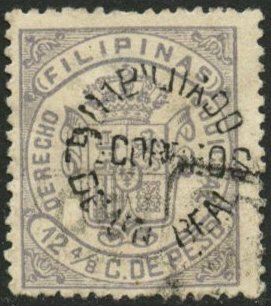 Base stamp centred bottom right. Good colour and well struck surcharge. Mint (NG). Base stamp centred right. Good colour with commonly found rough or blunt perfs. Very nice surcharge strike. Lovely looking stamp. Mint (NG, Light HR). Base stamp centred top left with fresh colour and decent perfs. Very clear and fresh surcharge strike. Lovely looking stamp. Used. 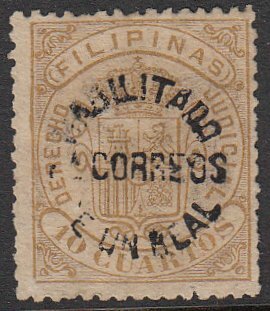 Correos – Manila CDS. 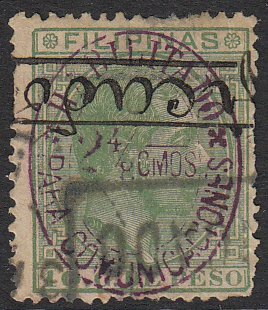 Base stamp centred bottom right. Rough perfs with odd blunt perfs noted. Good surcharge. Used. 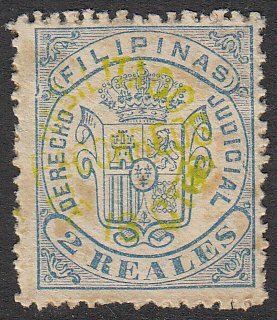 Well centred base stamp with one lightly pulled perf on bottom. Light cancel and clear surcharge. Used. Light partial Correos CDS. 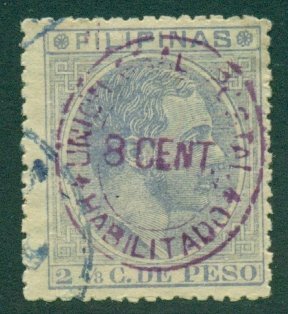 Generally well centred base stamp with average colour. Commonly found rough perfs. Nicely struck and clear surcharge. Used. 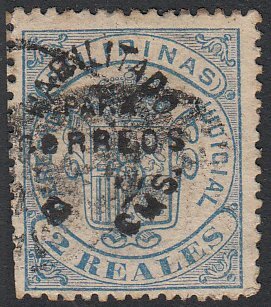 Partial Correos CDS. Base stamp centred right. Good colour with commonly found rough perfs or odd blunt perfs. 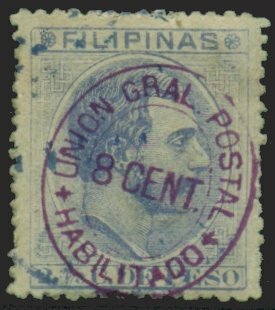 Average looking stamp. Used. Light cancel. 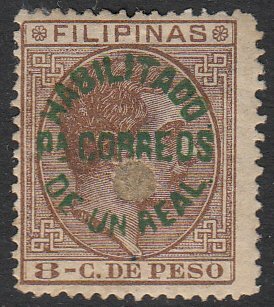 Base stamp centred bottom right. Minor thin on reverse not detracting overall appearance. Used. Base stamp centred top left. Light cancel and nicely struck surcharge. Odd rough perf, common for this issue. Used. Correos CDS. Base stamp centred left. Good colour and average perfs for this issue. Some toning on reverse, affecting the odd perf. Decent looking stamp. Used. 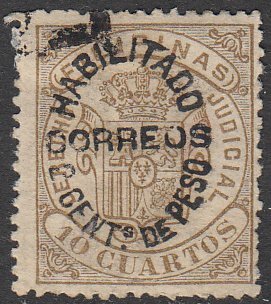 Partial Correos CDS. 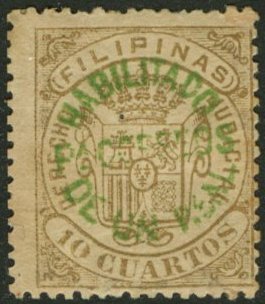 Base stamp centred top right. Good colour with decent perfs. Good surcharge. Nice looking stamp. Mint (NG, HR). 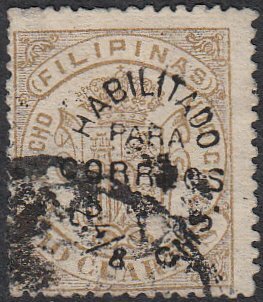 Base stamp centred bottom right. Rough or blunt perfs, common for this issue. 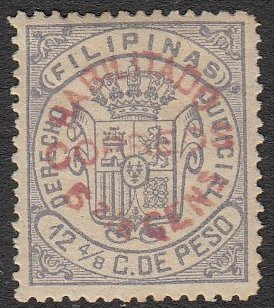 Minor mark on top perfs otherwise a nice looking stamp. Mint (Dry OG, Heavy HR). Centred bottom left. Good colour with very clear and nicely struck surcharge. Good looking stamp. Used. Indistinct Cancel. 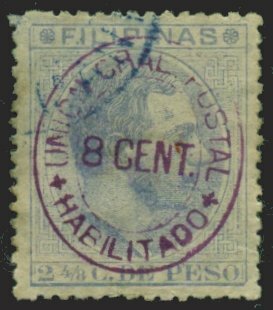 Base stamp centred low with commonly found rough perfs. Decent surcharge strike. Good overall appearance. Used. Light cancel. Base stamp centred slightly left. Good colour and decent perfs. Paper adhesion on reverse. Nicely struck surcharge. Used. Base stamp centred right. 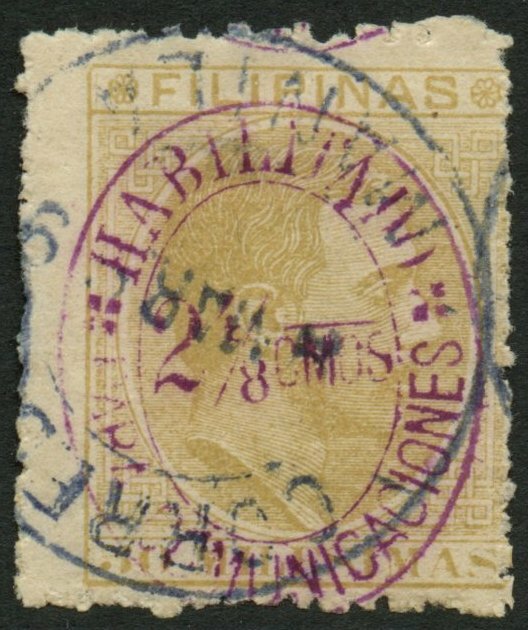 Light partial circular dated cancel. 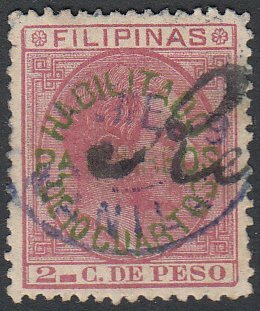 Average base stamp with good surcharge. Used. 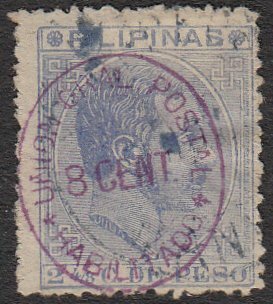 Base stamp generally well centred with good perfs for this issue. 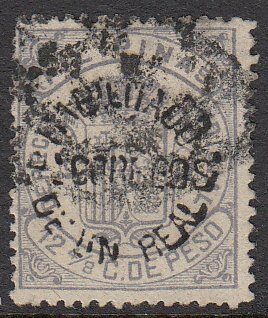 Light Correos circular date stamp. Nice and clear surcharge. Very appealing stamp. Used. Generally well centred for this issue. Odd blunt perfs noted, common for this issue. Light cancel. Nice overall appearance. Used. Partial Correos CDS on top left. 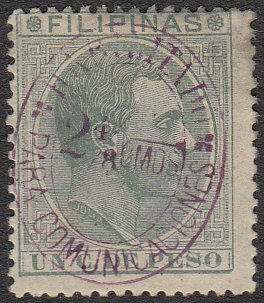 Generally well centred base stamp with good perfs for this issue. Some toning noted on some perfs (mainly on left side). Average surcharge strike. Used. 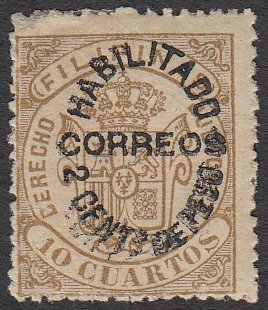 Partial Correos CDS. Generally good centring for this issue. Fresh colour and decent surcharge strike. Nice looking stamp. Used. 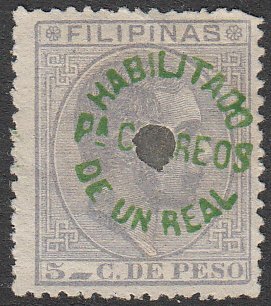 Telegraphic Hole Punch with Revisado Handstamp. Some minor toning noted. Odd blunt perfs otherwise a sound stamp. Used. Indistinct Cancel. 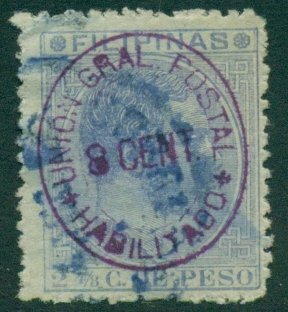 Base stamp centred low. Good colour and generally decent perfs for this issue. Clearly struck surcharge. Used. 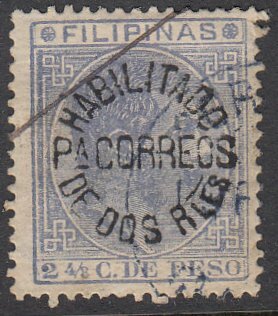 Partial Correos-Manila CDS. Average centring with decent colour. Some blunt perfs noted. Lightly struck surcharge. Light postal cancel. Good overall condition. Mint (Dry OG, HR). Base stamp centred top left. Good colour and decent perfs. Minor mark on top right perfs. Nice looking stamp. Mint (NG, HR). 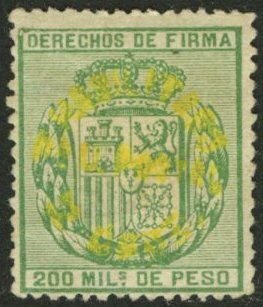 Base stamp centred high. Good colour with commonly found rough perfs. Very nicely struck surcharge. Nice looking stamp. Mint (Dry OG, HR). 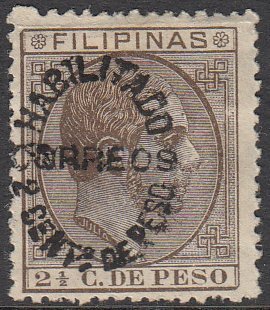 Base stamp centred high. Fresh colour and decent perfs for this issue. Very nicely struck surcharge. 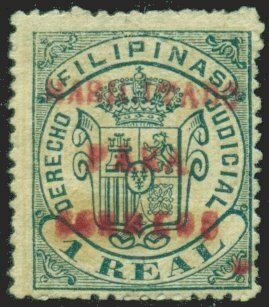 Beautiful looking stamp. 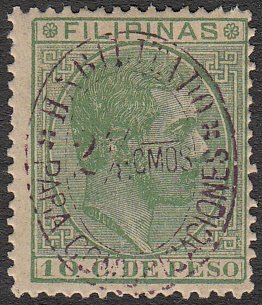 Mint (NG, HR) Generally well centred stamp with good colour. Nice clearly struck surcharge. Decent perfs for this issue. Nice looking stamp. Used. Parrilla Cancel. 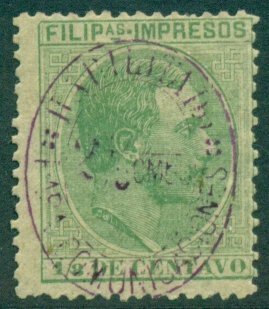 Base stamp centred top right with good colour and average perfs (blunt on top right corner). 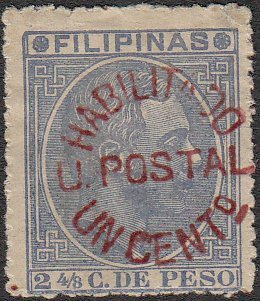 Decent surcharge strike and scarce postal usage of this issue. Used. Official Cancel. Base stamp centred right with deep colour. Some minor toning around perfs noted. Lovely deep official cancel. Decent surcharge strike. Scarcer usage. Mint (OG, Light HR). 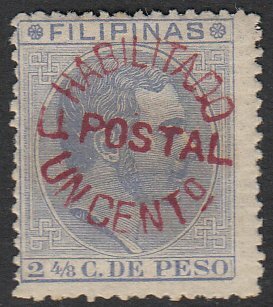 Well centred base stamp with average colour. Odd rough or blunt perf, commonly found on this issue. Decent looking stamp. Mint (OG, HR). 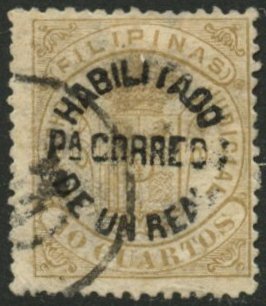 Base stamp centred high. Good colour and decent perfs for this issue. Nice and crisp surcharge strike. Very nice looking stamp. Mint (OG, HR). 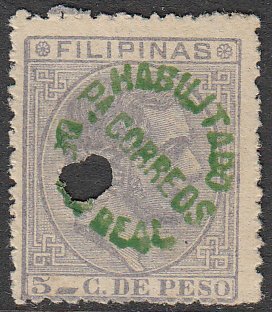 Base stamp centred top left. Generally decent perfs and good colour. 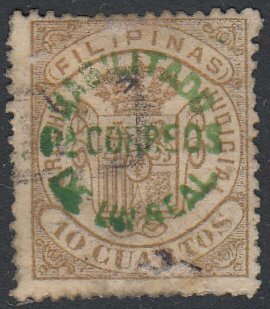 Tiny thin on reverse not showing through to front. 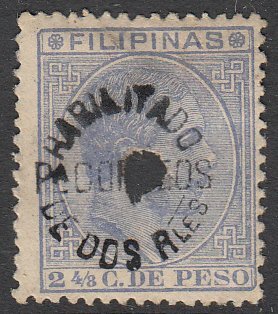 Nice overall looking stamp. Mint (Dry OG, HR). 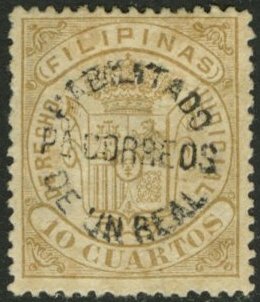 Base stamp centred top right. Odd blunt perf common for this issue. Used. 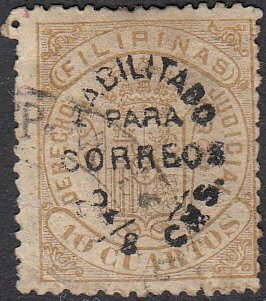 Correos de Filipinas Registration Cancel. 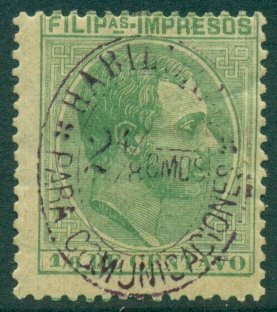 Base stamp centred right slightly with good colour and generally decent perfs. Nicely struck surcharge. Difficult usage, scarce. Used. Parrilla Cancel. 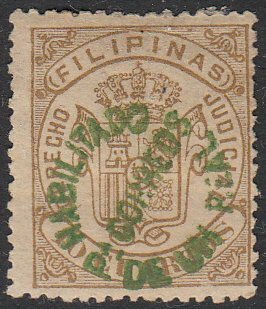 Base stamp centred top right. Average colour and commonly found rough or blunt perfs. Average surcharge strike. Scarce postal usage, understated in Scott. Mint (OG, Heavy HR). 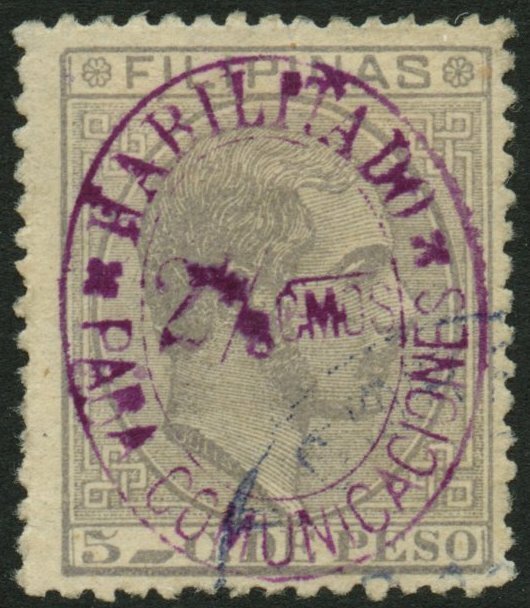 Base stamp centred top right. Good colour and generally nice perfs for this issue. Well struck surcharge. Mint (Dry OG, HR). 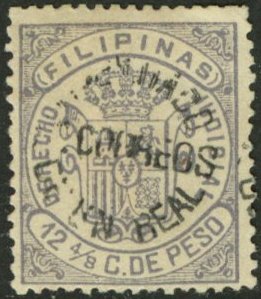 Base stamp centred top left. Average colour with good perfs (rounded perf on top left corner noted for accuracy). Good condition. Mint (NG). Well centred and vibrant colour on base stamp. Nicely struck surcharge. Mint (Dry OG, Heavy HR). Base stamp centred top left. Good colour and clearly struck surcharge. Mint (NG). 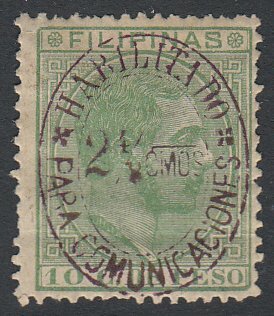 Base stamp centred top right. Good colour and good perfs for this issue. Mint (Dry OG, HR). Base stamp centred top left. Good colour with very good perfs. Light toning on gum side. Nice looking stamp. 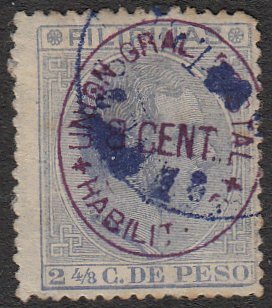 Mint (NG, HR). 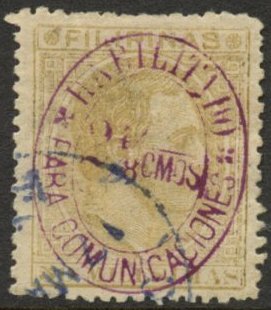 Base stamp centred top right. Good colour and nice overall appearance. Mint (NG). 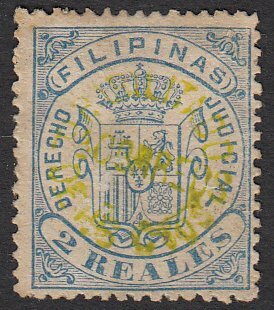 Base stamp centred top right. Good colour and decent perfs for this issue. Nicely struck surcharge. Mint (Dry OG, HR). Base stamp centred top left. Good colour with decent perfs. 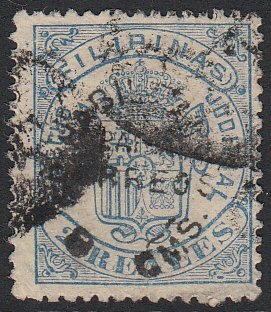 Nice looking stamp and seldom seen as such. Used. Correos CDS. Base stamp centred high slightly with decent colour and good perfs. Nicely struck surcharge. 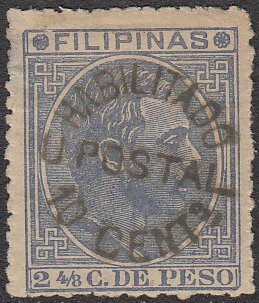 Difficult stamp to find used, despite low catalog value. Used. Correos CDS. 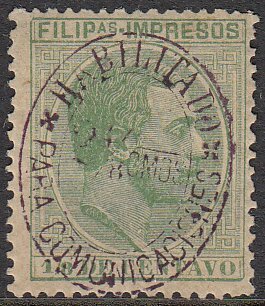 Base stamp centred top right with good colour and generally decent perfs. Nicely struck surcharge. Light postal strike not detracting overall appearance. Used. Correos CDS. 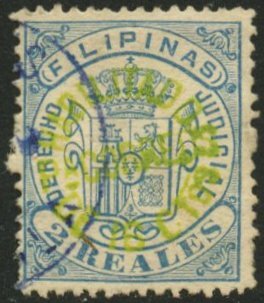 Base stamp centred top right. Good colour with average perfs. Light cancel not detracting overall appearance. Mint (OG, HR). 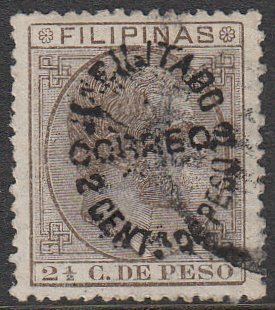 Base stamp centred slightly right. Fresh colour and decent perfs for this issue. Nicely struck surcharge. 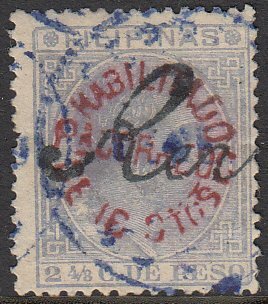 Lovely overall looking stamp. Mint (NG). 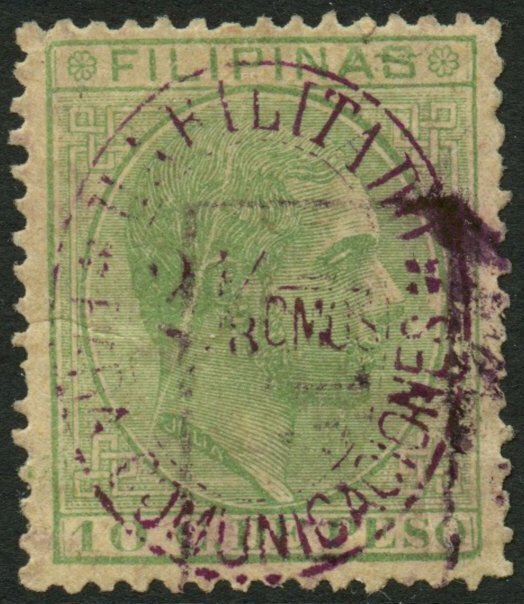 Base stamp centred bottom right. Rough perfs but with very crisp surcharge. Mint (Dry OG, HR). Generally well centred. Lighter shade with decent perfs for this issue. Lightly struck surcharge. 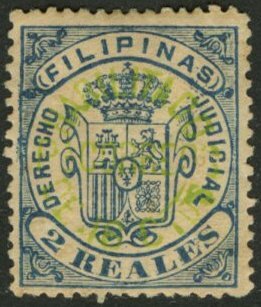 Appealing stamp. Used. 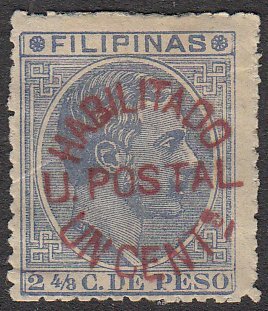 Partial Postal Cancel. 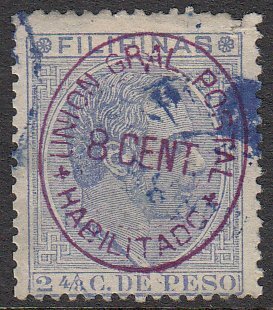 Well centred base stamp with commonly found rough perfs. Very nicely struck surcharge. Beautiful looking stamp. Used. 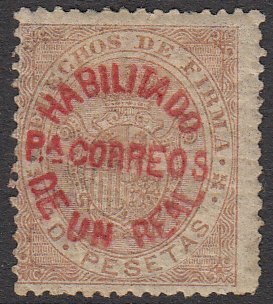 Partial Correos CDS. Generally well centred with commonly found rough perfs. Decent colour. More difficult to find used than indicated in Scott. Used. Parrilla Cancel. 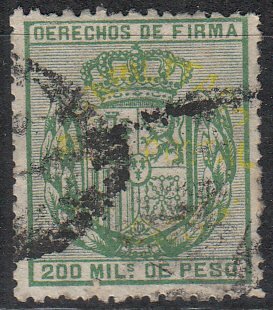 Base stamp centred right, good colour, with commonly found rough perfs. Nice clear surcharge strike. 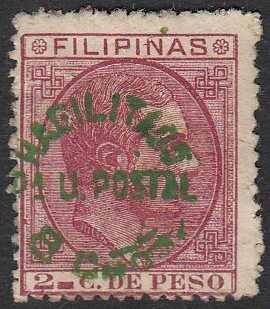 Very scarce postal usage and seldom seen. Mint (Dry OG, HR). Base stamp centred right. Good colour and average perfs for this issue. Nice overall appearance. Mint (Dry OG, HR). Base stamp centred top left. Good perfs for this issue with vibrant colour. Mint (Dry OG, HR). 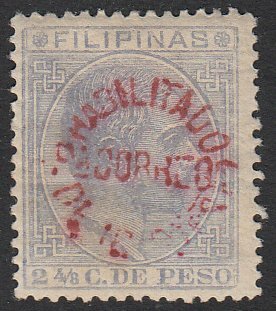 Base stamp well centred with good colour. Few blunt perfs noted, common for this issue. Good overall looking stamp. Mint (Dry OG, HR). Well centred base stamp with fresh colour. Commonly found rough or blunt perfs, rounded on bottom left corner. Decent surcharge strike. Mint (NG). Base stamp centred bottom left. Nice colour and decently struck surcharge. Good looking stamp. Mint (NG). Base stamp centred top left. 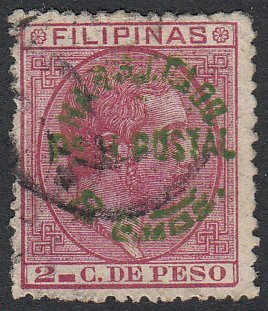 Good colour on base stamp. Surcharged to the left, splicing part of the surcharge. Nice looking stamp. Mint (NG). 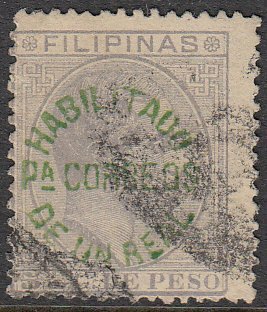 Base stamp centred top. Good colour and nicely struck surcharge. Very appealing stamp. Mint (NG, HR). Base stamp centred bottom left. Slight foxing causing dull appearance. Rough and odd blunt perfs, common for this issue. 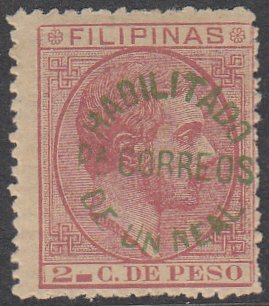 Average stamp. Mint (Dry OG, HR). Base stamp centred bottom left. Good colour with commonly found rough perfs. Lovely crisp surcharge. Decent looking stamp. Used. 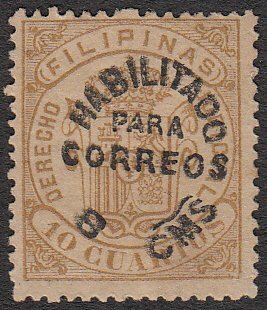 Correos – Manila CDS. Centred left with very fresh colour. 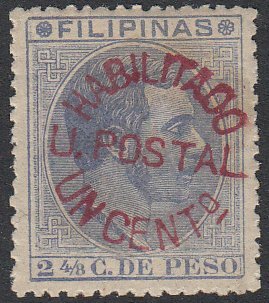 Extremely light postal cancel allowing surcharge and stamp to be shown clearly. Very fine postal usage. Used. 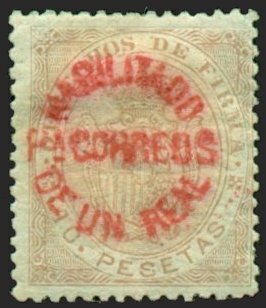 Large Boxed Cerfiticado Registration cancel. 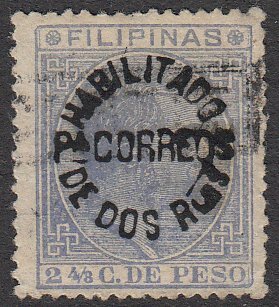 Odd blunt perf on a very fine looking stamp. 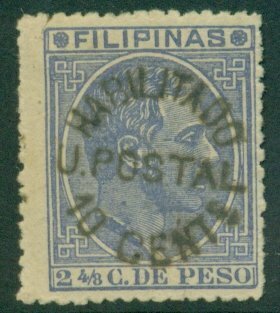 Scarce postal usage. With partial manuscript cancel. Unusual combination. Used. Official Cancel. 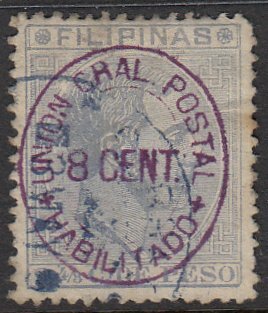 Generally well centred base stamp, somewhat dull colour. Light Albay cancel. Very fine looking stamp. Mint (Dry OG, HR). 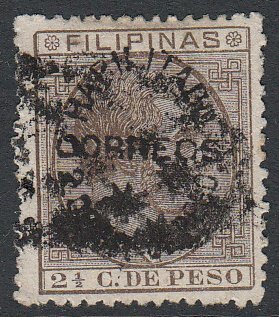 Base stamp centred low left. Good colour with commonly found rough or blunt perfs. Nice surcharge strike. Good overall looking stamp. Scott Cat $50. Mint (Dry OG, HR). Base stamp centred bottom left. Good colour with commonly found rough or blunt perfs. Surcharge Doubled Error. Scott Cat $50 as normal. Mint (Dry OG, Heavy HR). Base stamp centred bottom left. Fresh colour with commonly found rough or blunt perfs. Nicely struck surcharge. Difficult stamp. Scott Cat $50. Mint (OG, NH). Base stamp well centred with fresh colour and decent perfs. Superb surcharge strike. One of the finest copies we have seen. Scarce so fine. Scott Cat $50. Used. Parrilla Cancel. 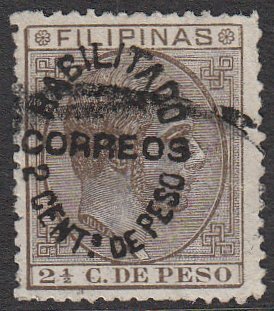 Base stamp centred low. Good colour with a few minor blunt perfs on right. Decent surcharge strike. 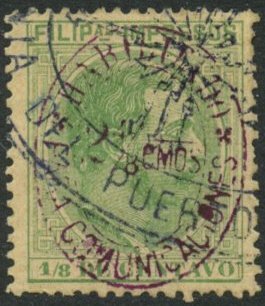 Difficult stamp to find postally used. Used. Telegraph Hole Punched. 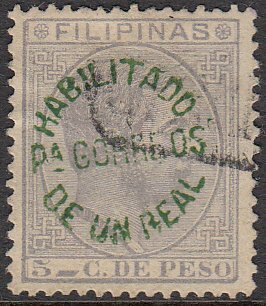 Base stamp centred bottom right. Good colour and generally decent perfs for this issue. Average surcharge strike. Mint (OG, Light HR). 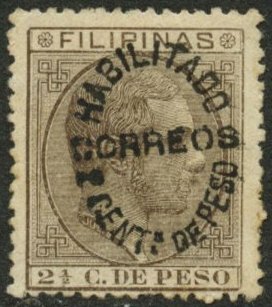 Base stamp centred high. Good colour and generally good perfs for this issue. Very nicely struck surcharge. Seldom seen so fine. Mint (NG). 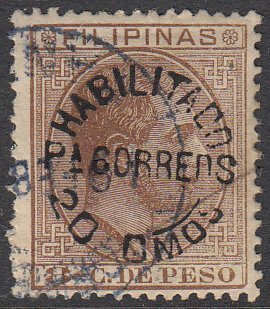 Narrow stamp (tight vertical perforations). Very fresh colour and lovely crisp surcharge centrally struck. 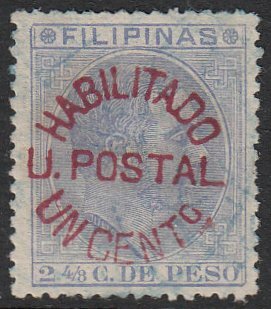 Interesting stamp and unusual. Mint (NG, HR). Base stamp with generally good centring and decent colour. Average perfs. Nice centrally struck surcharge. Nice looking stamp. Used. Indistinct Cancel. 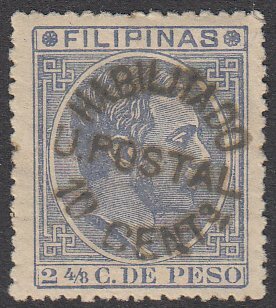 Narrow stamp centred high. Good colour. Light surcharge strike. 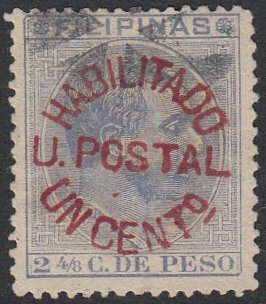 Average stamp. Used. Partial Lined Rhomboid Cancel. Generally well centred. Good colour and decent perfs for this issue. Light postal strike not detracting overall appearance. Scarce usage. Used. 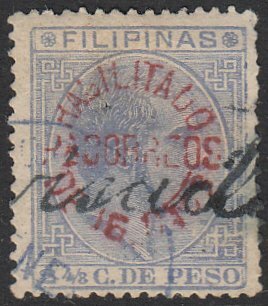 Very Light indistinct cancel on stamp with good base colour and nice surcharge. Odd blunt perf and minor thin on top noted for accuracy. Decent stamp. Used. Base stamp centred bottom left. 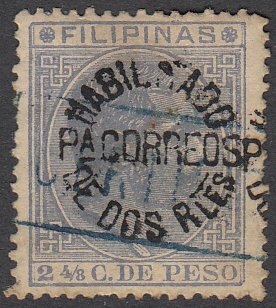 Few blunt perfs on left, otherwise a decent looking stamp. Used. Very Light indistinct cancel. 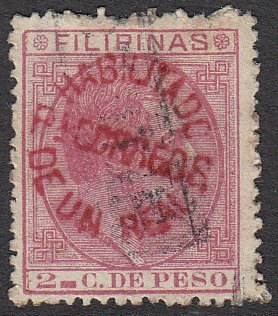 Base stamp slightly faded and light (partial) surcharge. Commonly found blunt perfs. Average condition. Used. Correos CDS. Base stamp centred left. Good colour and decent perfs. Light cancel not detracting overall appearance. 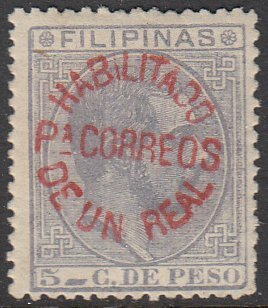 Partial Revisado handstamp. Used. Parrilla Cancel. Base stamp centred left with good colour and commonly found rough or blunt perfs. Decent surcharge strike. 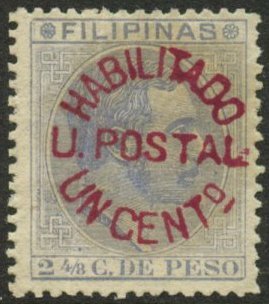 Average stamp. Used. 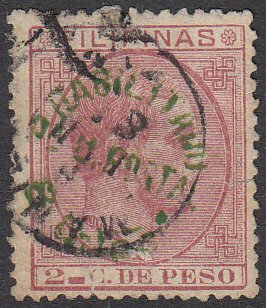 Possible Official Cancel. 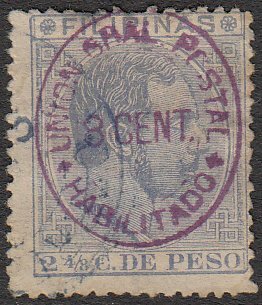 Base stamp well centred with good colour and average perfs. Centrally struck surcharge. Light cancel not detracting overall appearance. Used. Indistinct Cancel. 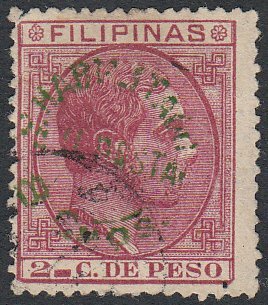 Generally well centred base stamp with good colour. Average surcharge strike. Good looking stamp. Used. Parrilla Cancel. 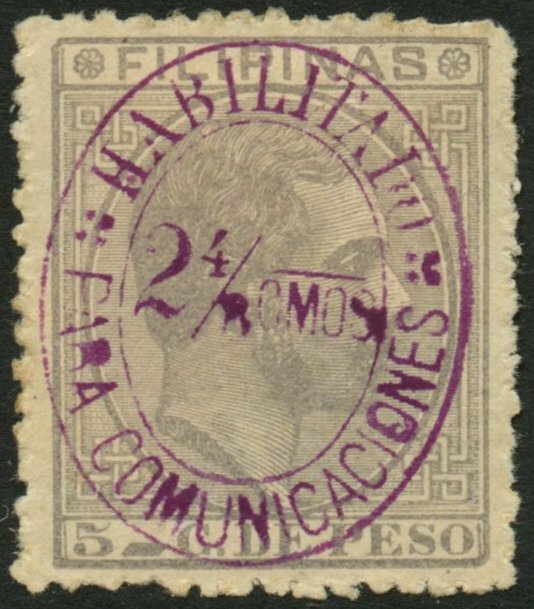 Base stamp centred top right. Good colour with decent perfs for this issue. Light cancel not detracting overall appearance. Mint (NG, HR). Base stamp centred bottom left. Fresh colour. Minor thin on top right causing blunt perfs and rounded top right corner. Very nice and clear surcharge. 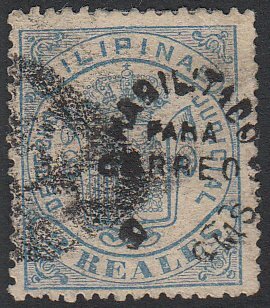 Scarce Stamp and missing in a lot of collections. Scott Cat $200. Mint (NG, Light HR). Base stamp centred top left. Very fresh colour and decent perfs for this issue. Very crisp and clear surcharge. 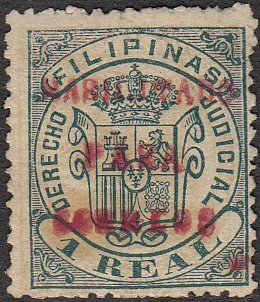 Minor foxing on reverse not affecting overall appearance of this beautiful stamp. Very scarce. Scott Cat $450. Mint (OG, Heavy HR). Base stamp centred bottom right with very fresh, vibrant colour. Decent perfs for this issue. Paper adherence on reverse. Very crisp surcharge. Lovely looking stamp. Mint (NG, HR). Base stamp centred bottom left. Good colour with generally decent perfs. Minor thin on reverse just showing on few top perfs. Nice surcharge. Good looking stamp. Used. Smudged cancel. Odd blunt perf noted for accuracy. Nice clear surcharge for this issue. Used. Parrilla cancel. 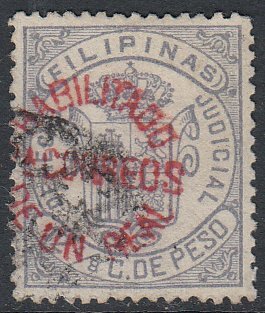 Base stamp generally well centred. Light postal strike with decent surcharge. Blunt perfs on bottom left (just cut into). Good looking stamp. Used. Parrilla Cancel. 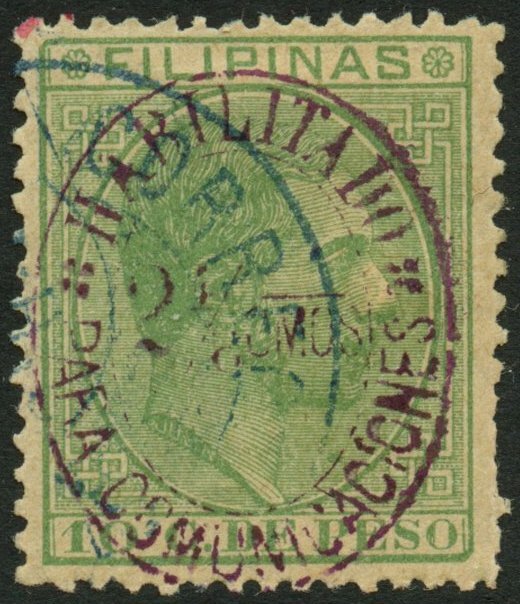 Base stamp centred top right. Good colour and average perfs for this issue. Slightly smudged cancel. Light surcharge (partially missing). 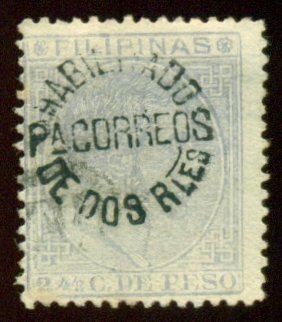 Average stamp. Used. Parrilla Cancel. Generally well centred with good base colour. Odd blunt perf noted, common for this issue. Surcharge centred right. Decent looking stamp. Used. Telegraph Hole Punched. Base stamp centred right. Good colour with commonly found rough or blunt perfs. Decent looking stamp. Used. Possibly Parrilla Cancel. Base stamp well centred with fresh colour and decent perfs. Average surcharge strike. Nice looking stamp. Used. Parrilla Cancel. 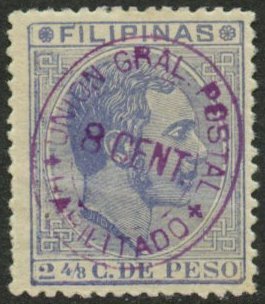 Generally well centred base stamp with good colour. 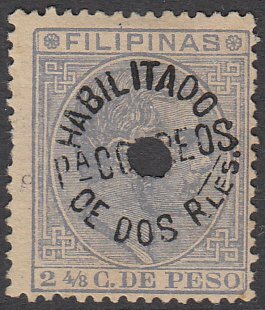 Nice overall looking stamp. Used. Smudged Parrilla Cancel. 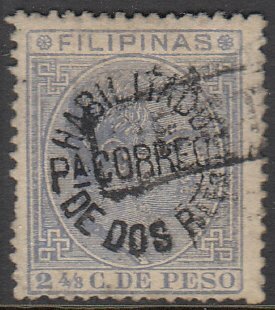 Base stamp centred right with average perfs for this issue. Centrally struck surcharge. Odd tone spots on perfs. Average condition. Used. Possibly Parrilla Cancel. 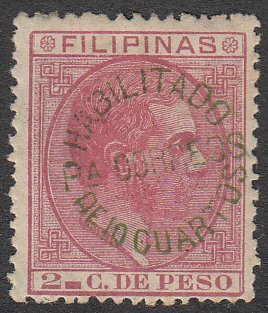 Base stamp generally well centred with good colour. Nice centrally struck surcharge. Odd minor toning, mainly around perfs noted. 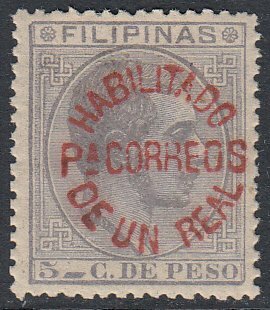 Average stamp. Used. Telegraph Hole Punched. Generally well centred with very fresh appearance. Nicely struck central surcharge. Lovely looking stamp. Mint (OG, HR). 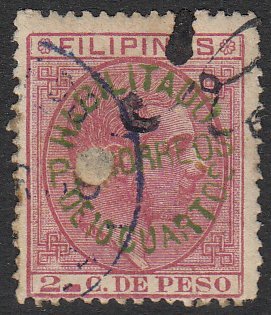 Base stamp centred left slightly. Very fresh colour with generally good perfs. Nice crisp surcharge. A lovely looking stamp. Mint (OG, HR). Base stamp centred left with good colour and commonly found rough or blunt perfs. Average surcharge strike. Decent looking stamp. Used. Parrilla Cancel. Base stamp centred top left. Good colour with generally decent perfs. Nicely struck surcharge. 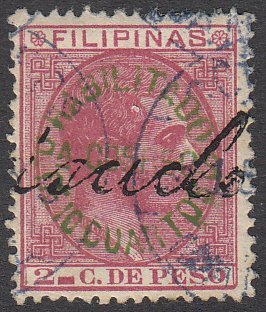 Scarcer postal usage for this issue. Used. Fancy ‘Certif’ Registration Cancel. 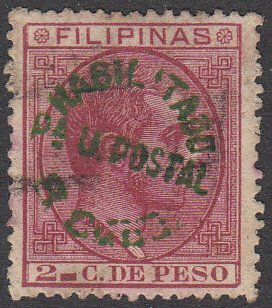 Generally well centred base stamp with good colour and decent perfs. Average surcharge strike. Nice looking stamp. Used. Indistinct Cancel. 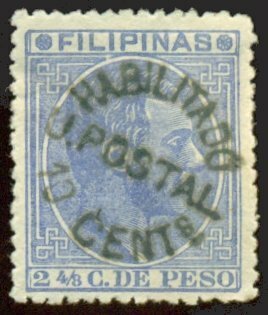 Well centred base stamp with good colour. Nicely struck surcharge. 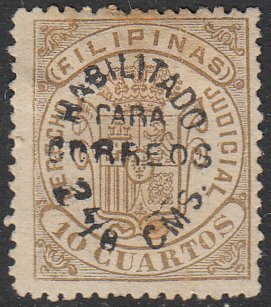 Light cancel providing very fine appearance on this stamp. Used. Boxed Certif Registration Cancel. 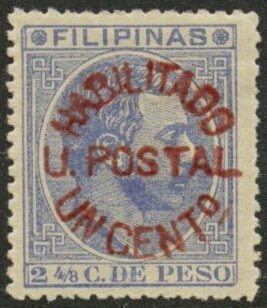 Generally well centred base stamp with fresh colour. 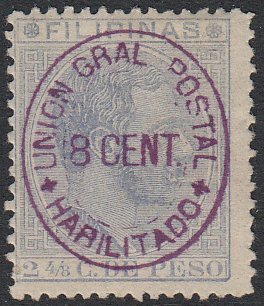 Fine overall appearance with scarcer postal usage. Mint (Dry OG, HR). 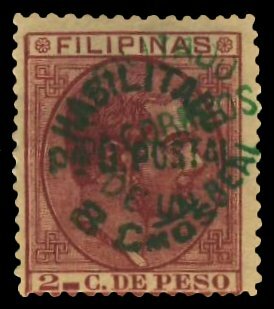 Base stamp centred left. Average colour with some foxing from disturbed gum. Minor tone spots on right. Very nice crisp surcharge. Difficult stamp. Mint (NG, HR). 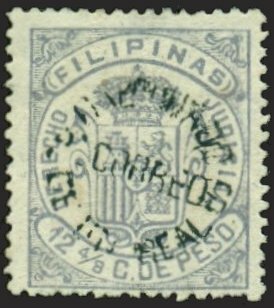 Base stamp centred top right. 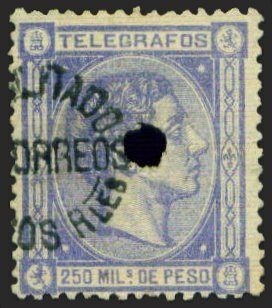 Good colour with odd blunt perfs noted (common for this issue). Decent surcharge strike. 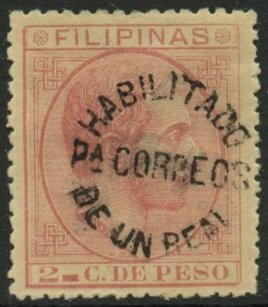 Average stamp. Mint (NG, HR). Base stamp centred top left with fresh colour. Commonly found blunt perf. Decent surcharge strike. 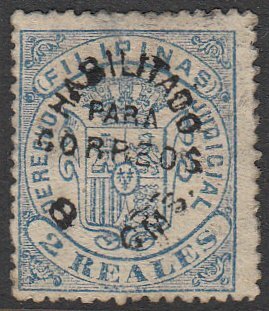 Very attractive stamp and seldom found so fine. Used. Indistinct Cancel. 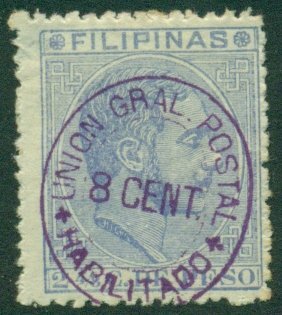 Base stamp centred low. Good colour with commonly found rough perfs. Light surcharge. 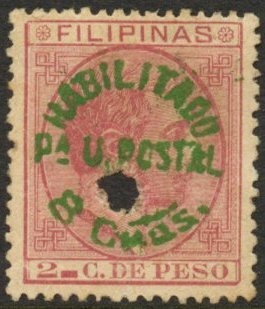 Average stamp. Used. Indistinct Cancel. Base stamp centred top left with decent colour. Odd blunt perfs on left noted. Average surcharge strike. Used. Eight Sided Dot Cancel. 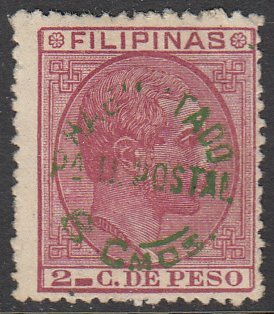 Base stamp centred top right with decent colour. Some minor perf toning noted. 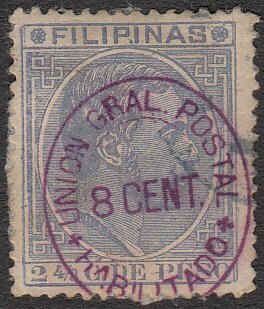 Very scarce postal usage. Mint (NG, HR). Base stamp centred right. Fresh colour and good perfs for this issue. Nice centrally struck surcharge. Lovely looking stamp. Mint (NG,HR). Base stamp centred low with very fresh colour. Thin on reverse not affecting front appearance. Clear surcharge strike. Difficult to find fine mint. Used. Parrilla Cancel. Base stamp centred bottom left. Good colour with decent perfs. 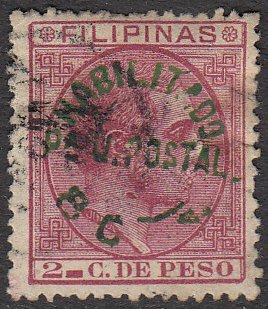 Somewhat smudged postal strikes, with additional partial red cancel. Good stamp. Used. Indistinct Cancel. Base stamp well centred with good colour and decent perfs. Slightly smudged cancel. Decent surcharge strike. 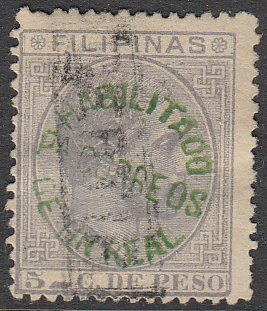 Difficult stamp to find in fine condition. Used. Manila – Star CDS. 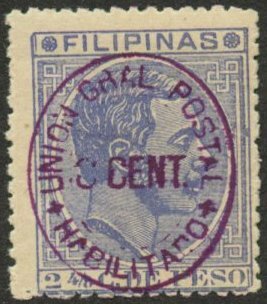 Generally well centred base stamp with good colour. Some blunt and pulled perfs mainly on top. Light cancel. 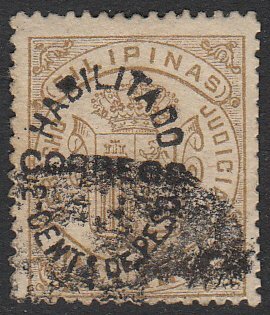 Scarce to find postally used. Average condition. Used. Parrilla Cancel. 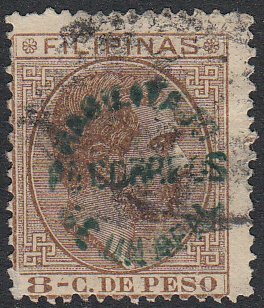 Good colour on base stamp with commonly found rough perfs. 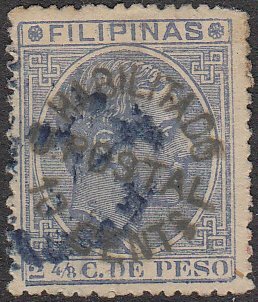 Light postal strikes not detracting overall appearance. 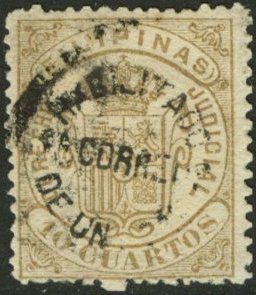 Scarce to find postally used. Mint (NG, HR). 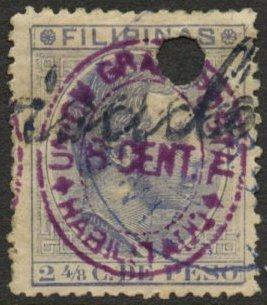 Base stamp centred low. Very fresh, vibrant colour with good perfs for this issue. Decent surcharge strike. 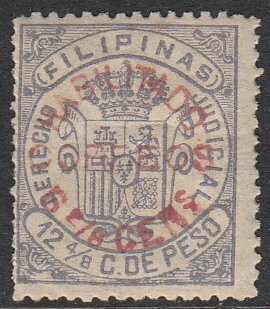 A stunning stamp and seldom seen so fine. Mint (NG, HR). 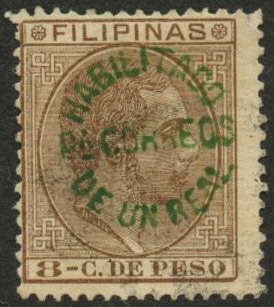 Base stamp centred high. Good colour and decent perfs (odd minor blunt perfs noted on bottom). Slight foxing giving duller impression. 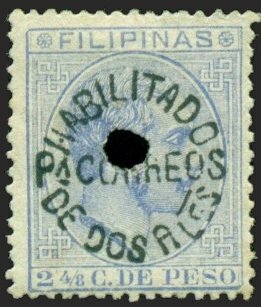 Difficult stamp. Mint (NG, HR). Base stamp centred left. Good colour (light shade) with rough and blunt perfs, mainly on top. Paper adhesion on back which should wash off. Nicely struck surcharge. Mint (NG, HR). 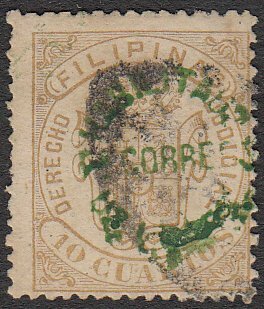 Base stamp centred top right. Good colour with commonly found rough or blunt perfs. Nice surcharge strike. Good overall condition. Mint (NG, HR). 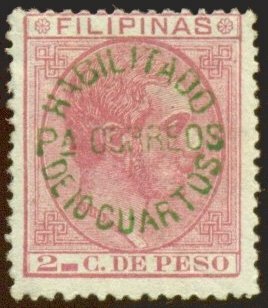 Base stamp generally well centred. Good colour and decent perfs for this issue. Good surcharge strike. 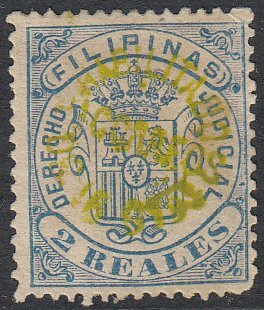 A nice overall looking stamp. Mint (NG). Base stamp centred high with good colour. Commonly found rough or blunt perfs. Average surcharge strike. Decent looking stamp. Mint (NG, HR). 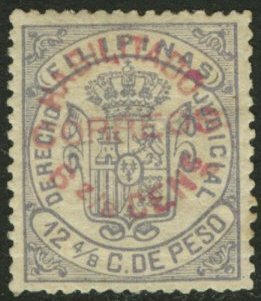 Base stamp generally well centred. Good colour. 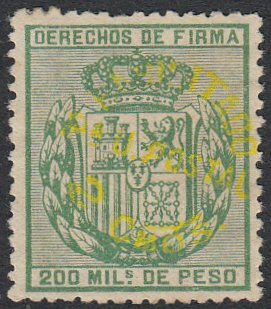 Slight foxing noted around perfs, otherwise a lovely looking stamp. Mint (NG, HR). 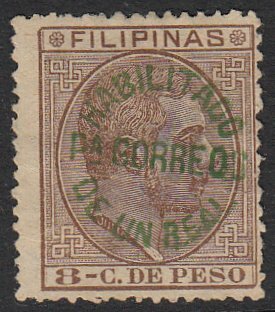 Base stamp centred bottom left with good colour. Average perfs for this issue. Good overall appearance. Used. 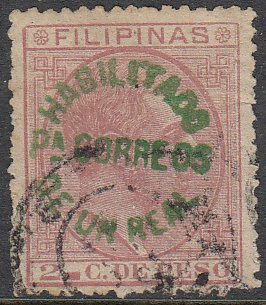 Correos – Manila CDS. 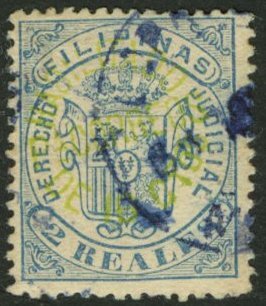 Good colour on base stamp, with commonly found rough or blunt perfs. 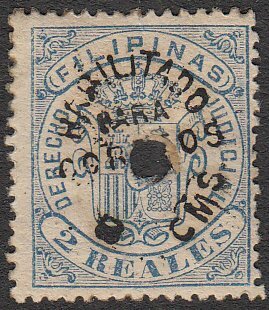 Cut into on top left (perf damage) Lovely postal strike, seldom seen so fine on this issue. Used. 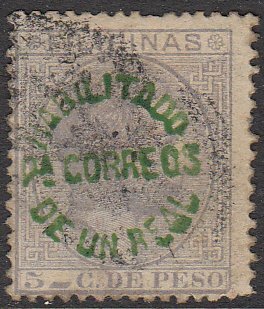 Correos – Manila CDS. 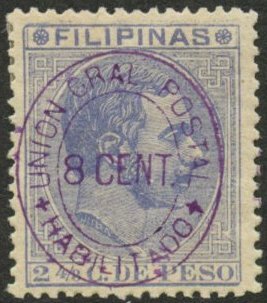 Good colour on base stamp, with commonly found rough or blunt perfs. Light postal strike. Scarce usage. Used. 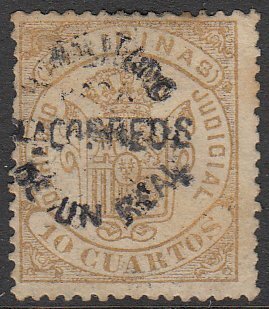 Partial Correos CDS. 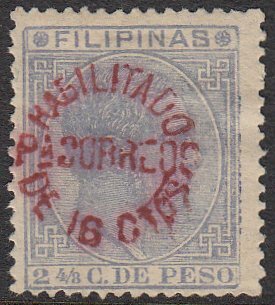 Generally well centred base stamp with good colour. Commonly found rough perfs. 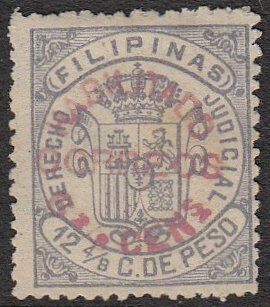 Beautiful and fine looking stamp. Mint (NG, HR). 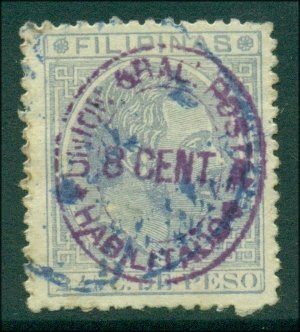 Base stamp centred low. Good colour with commonly found rough or blunt perfs. Decent surcharge strike. 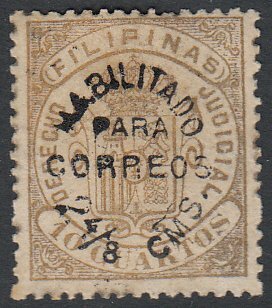 Nice overall looking stamp. Used. Indistinct Blue Cancel. 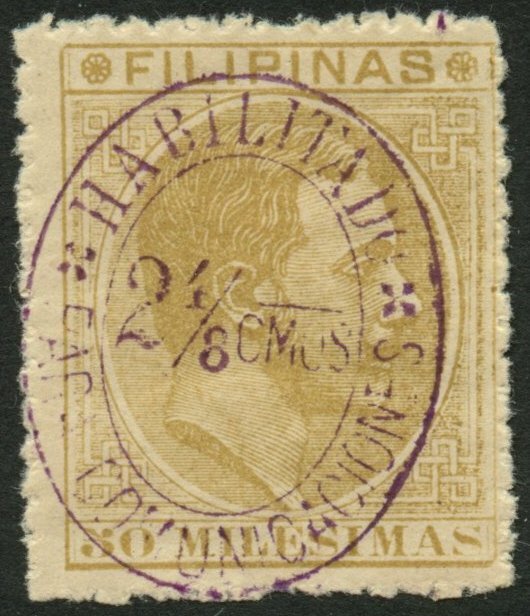 Base stamp centred low. Few blunt perfs on top otherwise a decent looking stamp. Used. Parrilla Cancel. Base stamp centred bottom left. Good colour with generally acceptable perfs. 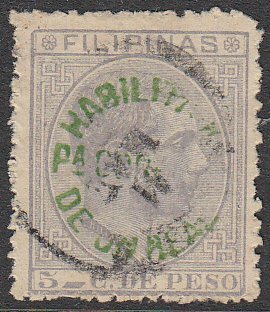 Good looking stamp with difficult postal usage. Used. Indistinct Cancel. 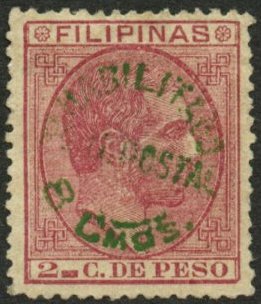 Base stamp generally well centred with good colour. Odd blunt perfs noted, common for this issue. 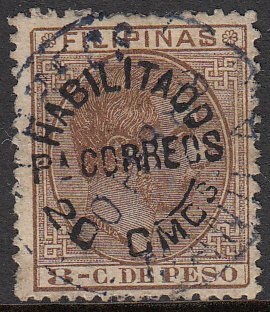 Nice overall looking stamp. Used. Light boxed Certif Registration Cancel. 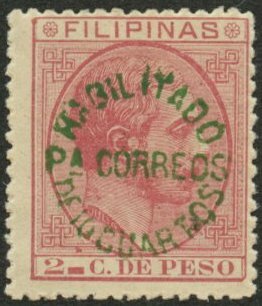 Base stamp centred high. Some toning showing through to front. Decent surcharge strike. Average condition. Used. Boxed Certif Registration Cancel. Base stamp centred bottom left. Good colour with some blunt perfs on left. Light cancel not detracting overall appearance. 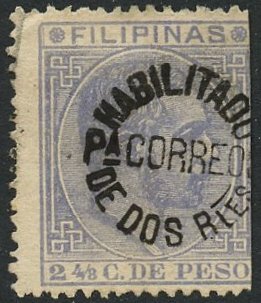 Average stamp. Mint (NG, HR). 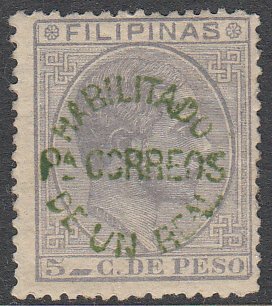 Base stamp generally well centred. Good colour with generally decent perfs for this issue. 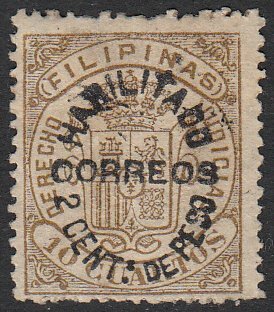 Scarce stamp and seldom offered. Scott Cat $55. Mint (Dry OG, Heavy HR). Base stamp centred left with fresh colour and commonly found rough perfs. Lovely centrally applied surcharge strike. 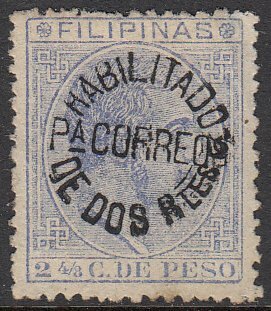 Nice overall looking stamp. Used. Parrilla Cancel. 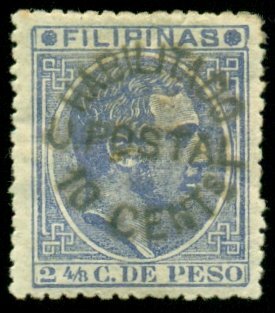 Base stamp centred left with fresh colour and generally decent perfs for this issue. Average surcharge strike. Hinge remains on reverse, should wash off. Nice stamp. Used. Telegraph Hold Punch. 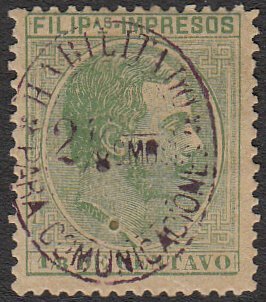 Nice centred base stamp with vibrant colour and decent perfs. Very crisp surcharge. 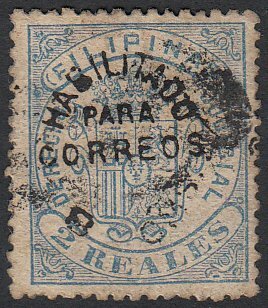 A gorgeous looking stamp, seldom seen so nice. Mint (NG, HR). 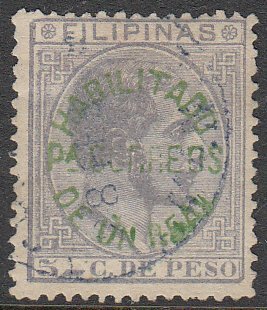 Base stamp shifted left slightly. Good colour with decent perfs. Decent surcharge. Nice looking stamp. 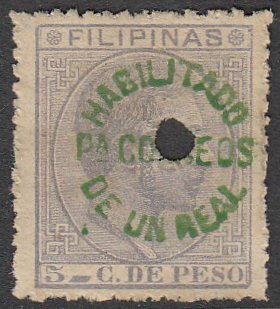 Mint (NG, HR), Base stamp centred right. Good colour. Rough or odd blunt perfs. Nice surcharge strike. Good looking stamp. Mint (NG, HR). Base stamp centred left. Good colour with commonly found rough or blunt perfs. Nicely struck surcharge. Overall, a good looking stamp. Mint (NG, HR). General well centred. 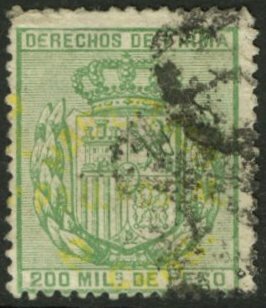 Dull colour caused from foxing. Odd blunt perf noted, mainly on top. 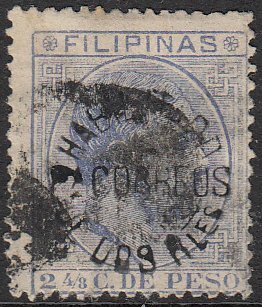 Average stamp. Mint (Dry OG, HR). 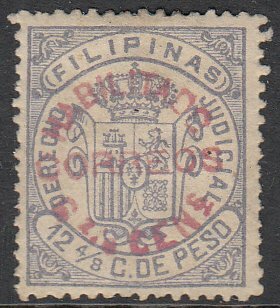 Very well centred base stamp with generally good perfs. Decent colour and centrally struck surcharge. Very nice looking stamp. Mint (Dry OG, HR). Generally well centred with good colour. Decent perfs for this issue. Nice centrally struck surcharge. Very nice looking stamp. Mint (NG). Base stamp centred left. Good colour and nice centrally struck surcharge. 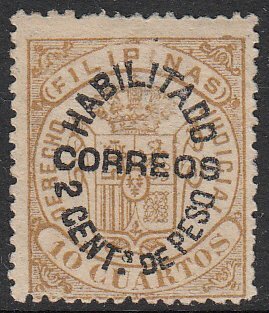 Lovely stoking stamp. Mint (NG). 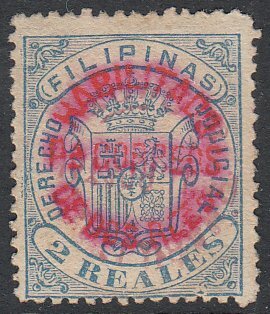 Generally well centred base stamp with fresh colour. Nice centrally struck surcharge. Very nice and appealing stamp. Mint (OG, HR). Base stamp centred left. Good colour and average perfs, some blunt on right side. Very clear surcharge strike. 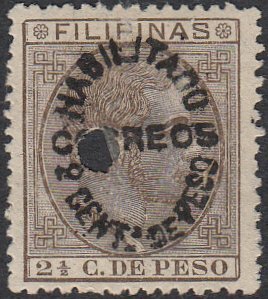 A difficult stamp and seldom offered mint. Scott Cat $95. Mint (OG, HR, showing on top). Base stamp centred left with fresh colour. Good perfs for this issue and nicely struck surcharge. Very scarce. Scott Cat $95. Used. Telegraph Hole Punched. 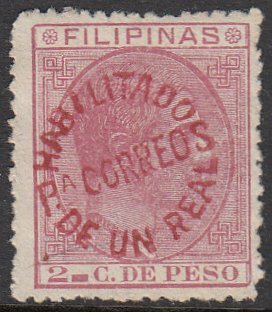 Base stamp centred right slightly. Good colour with decent perfs (a couple of blunt perfs on left noted). 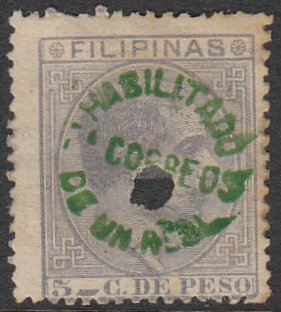 Difficult stamp to find used. Used. Circle of Dots Cancel. 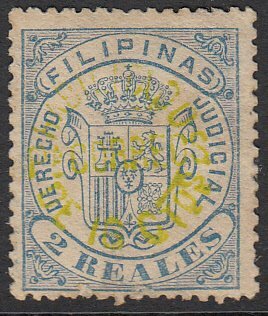 Base stamp generally well centred with good colour. Rounded top right corner otherwise decent perfs. Good surcharge strike. 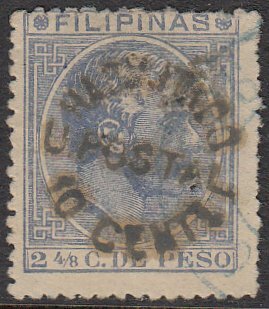 Very scarce postal usage. Used. Telegraph Hole Punched. 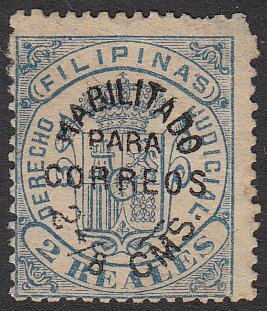 Base stamp centred top right. Fresh colour and decent perfs. Hole filled on back. Decent surcharge. Mint (NG). Base stamp centred bottom right with vibrant colour and commonly found rough perfs. Clean and crisp overprint. Slight ink seepage into back from overprint. Scott Cat $350. 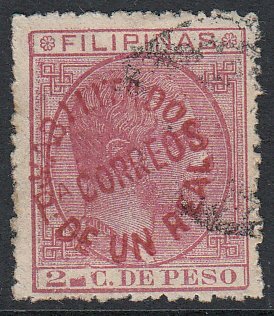 Very Scarce and missing in most collections.